Click here to return to the General 2013 page. 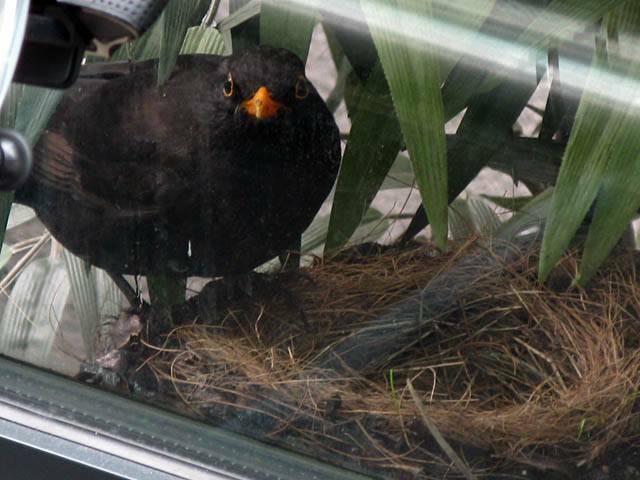 A Blackbird started building a nest on the window ledge right next to a busy office stairwell in Camden Town. I first noticed around Wednesday 8th May 2013. 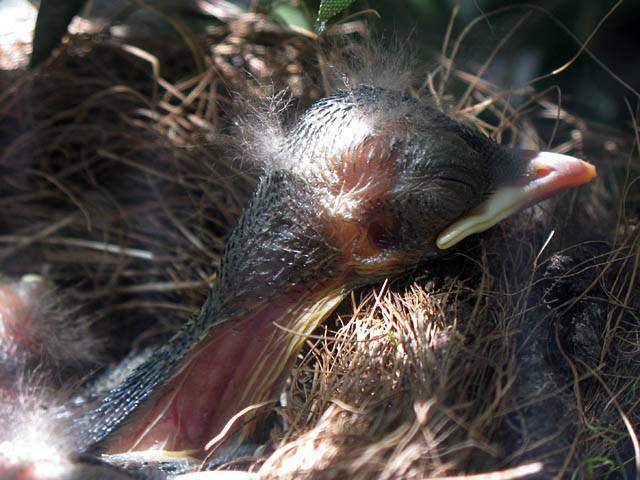 From just a small pile of debris the nest expanded into an exsquisitely fully formed creation over half a week. 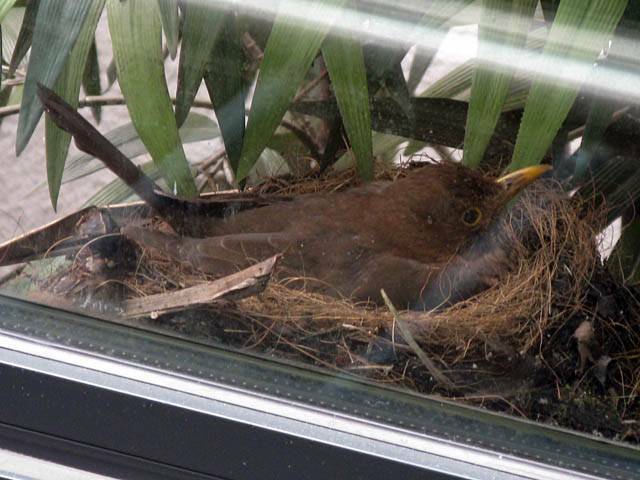 After lying empty for a day on Monday 13th, the bird returned. It was the same pattern on Tuesday and Wednesday. 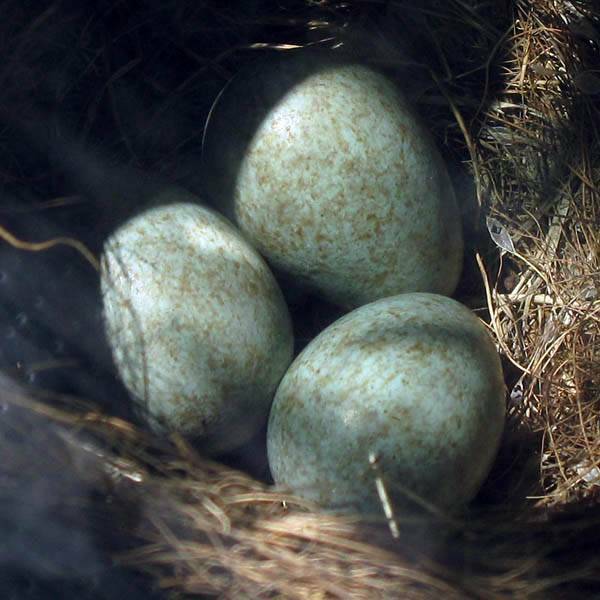 She arrived around the 8:30AM'ish mark, was seen resting in the nest, sometimes falling asleep, before vanishing at lunchtime, revealing a freshly laid egg in the nest. 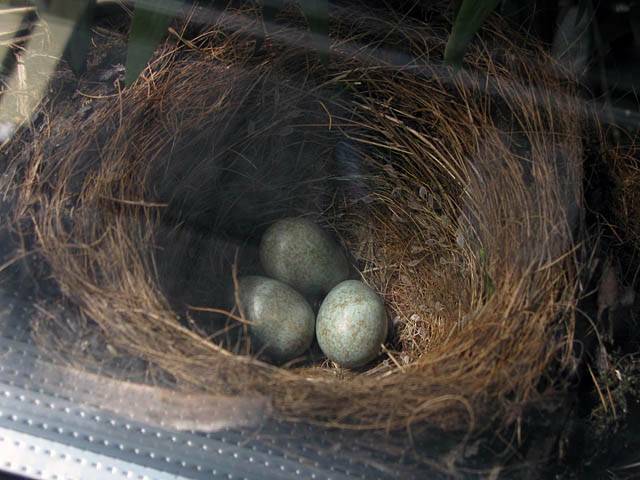 She'd return next morning to lay the next egg. 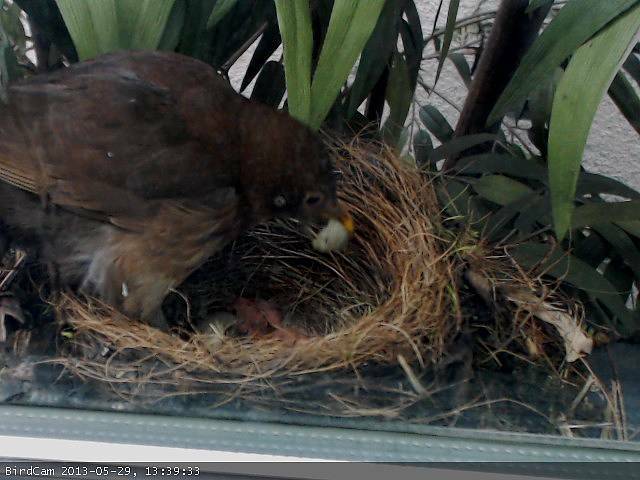 After egg number 3 she started appearing more in the afternoon. 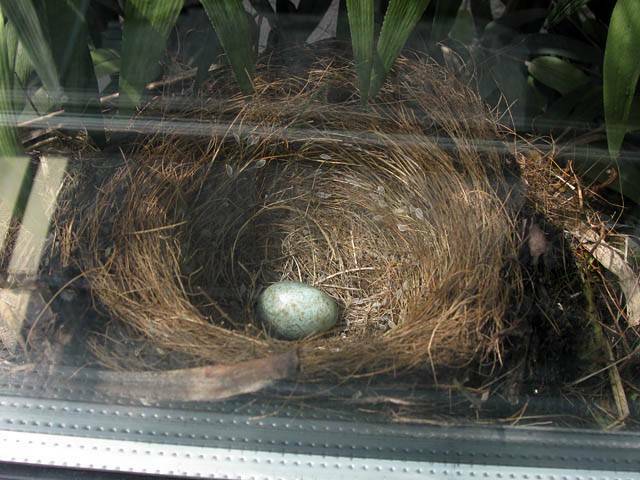 Note: At first we thought egg number one had been abandoned as it was left all afternoon to go cold. 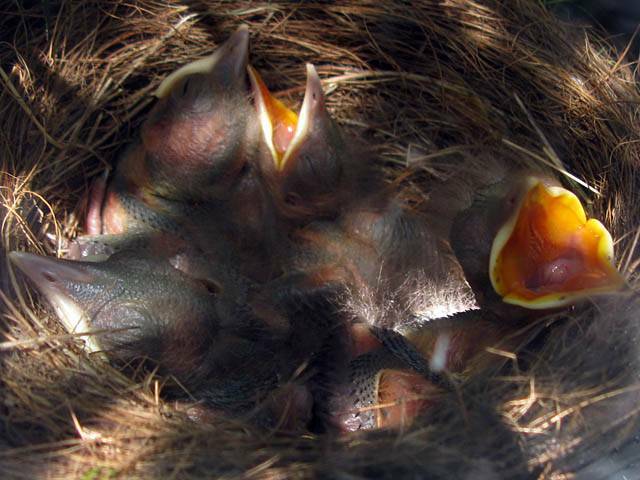 But maybe keeping it cool slows development so they all hatch together? 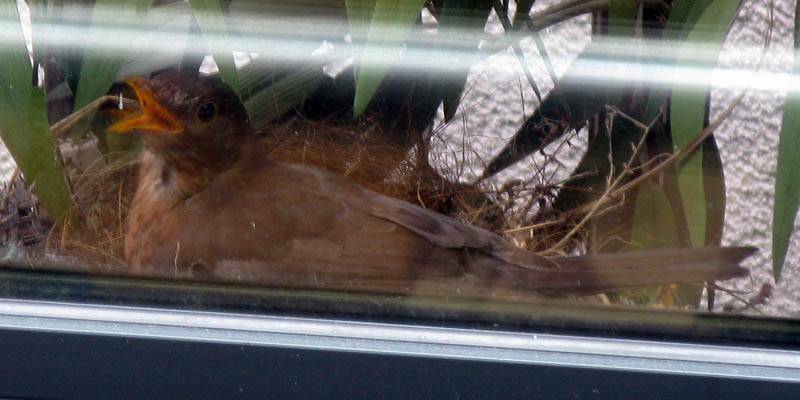 Reading up on Blackbird nests also shows they don't start incubating properly until all eggs are laid so all OK.
On Friday 17th May she arrived a little later and disappeared late morning with still only 3 eggs. But she reappeared over lunchtime. 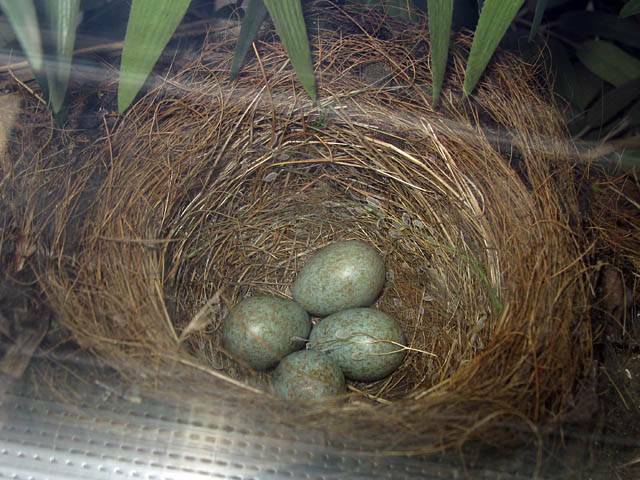 When I went for a meeting though at 2:30pm the nest was empty, but for 4 eggs. By meeting end she was back. 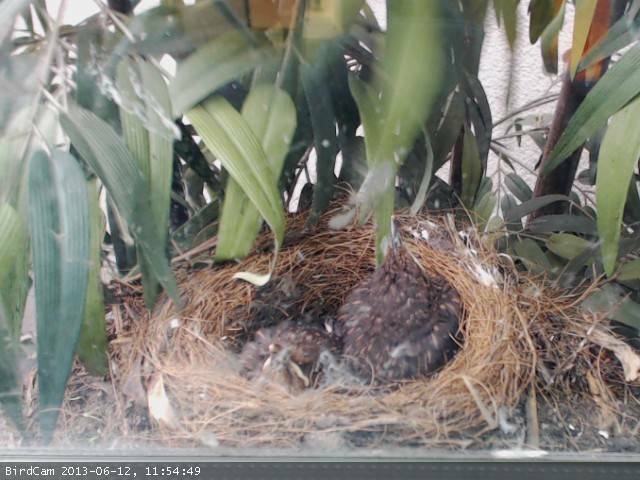 So egg number 4 took a little longer to appear and more and more time is spent on the nest. She disappeared around tea time allowing me to get a picture, and I didn't see her again this day. 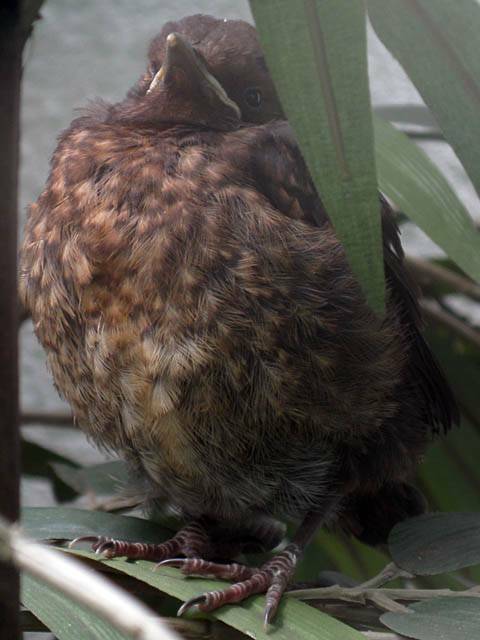 Early low light level shots of the Female Blackbird resting between material gathering missions. A better shot at lunchtime when the sun came out. 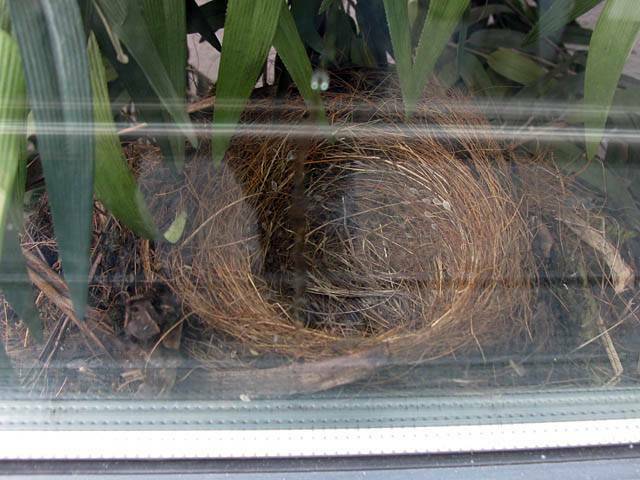 A completed but empty nest. Where did she go? 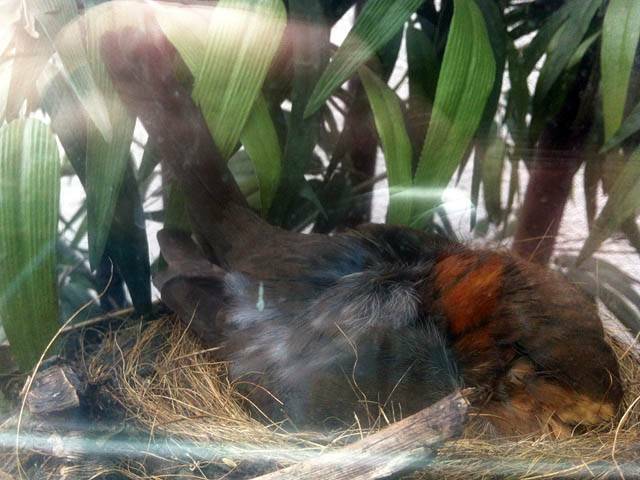 Resting after laying her first egg. 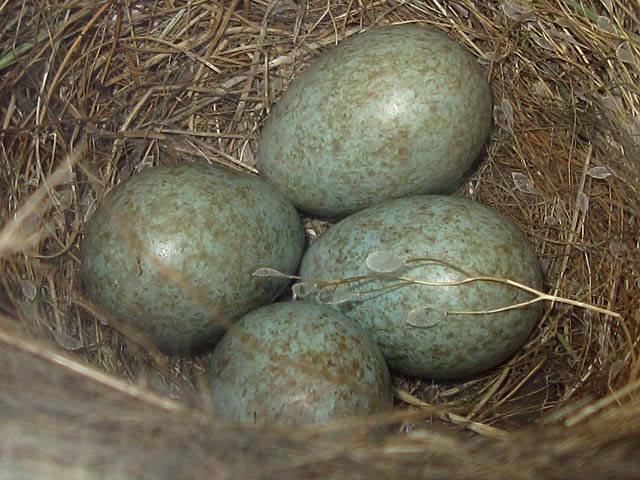 The blackbird vanished at lunchtime leaving behind a pretty green speckled egg on 14th. 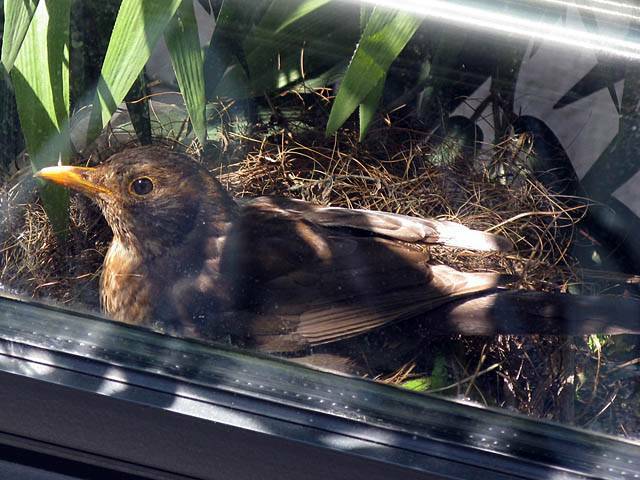 However by the time I left work it had been unincubated for maybe 5 hours. What a shame (we thought at the time). I wonder where she went? 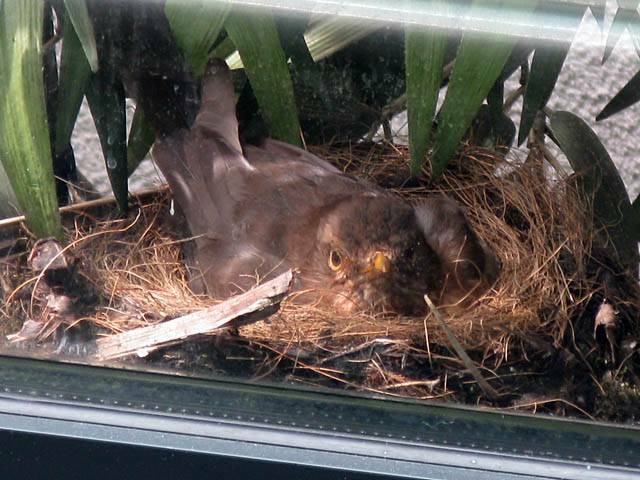 The DPA Blackbird having a snooze at her 'desk'. Note that the reddish patch is down to sunlight reflections and nothing to do with pigmentation. Well that explains why she was snoozing. 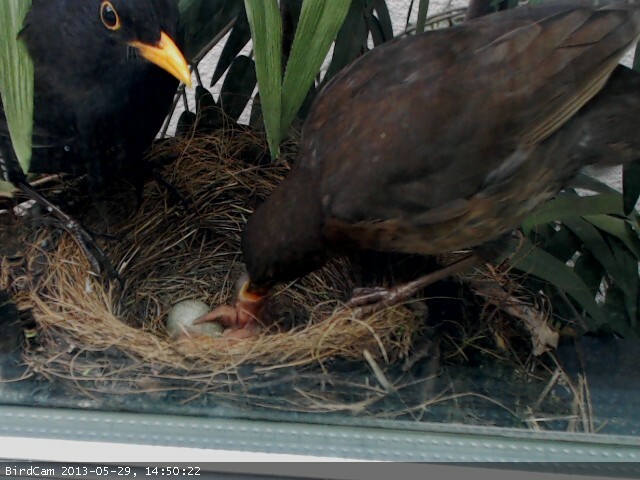 She's gone to lunch and we can see a 2nd freshly laid egg on 15th. 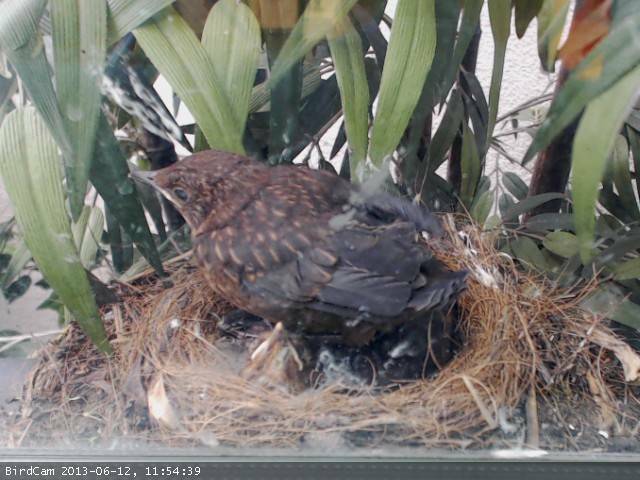 Another view of the Blackbird as she continues her egg laying. 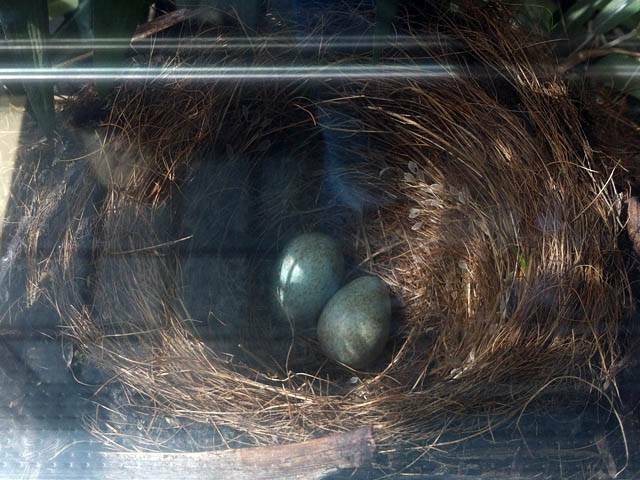 There are now 3 eggs! 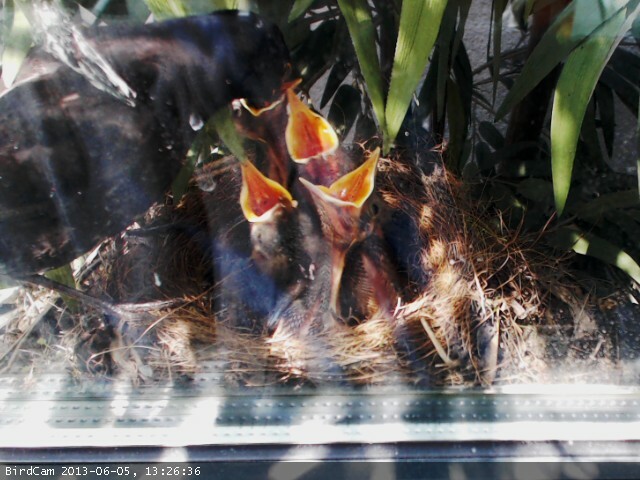 Photographed on 16th while a shaft on sunlight illuminates them at lunchtime. 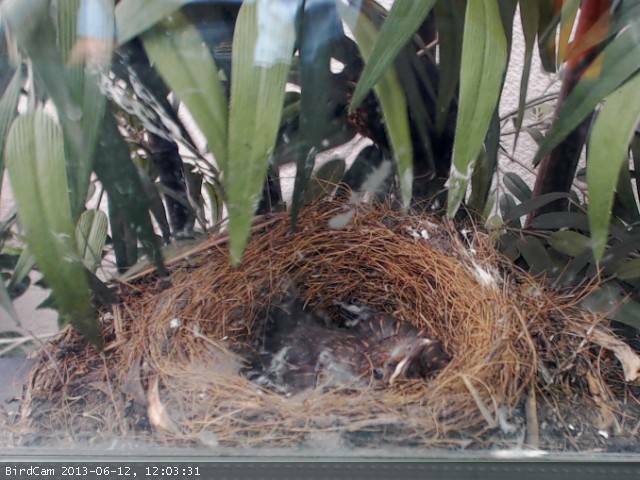 Egg number 4 appeared around lunchtime on 17th. Light levels were very poor and reflections were bad so I decided to use the flash while there was no bird around to scare. Mind the reflections. Being a busy stairwell with chrome handrails, an awkward sun angle and dark shadows they are hard to avoid. 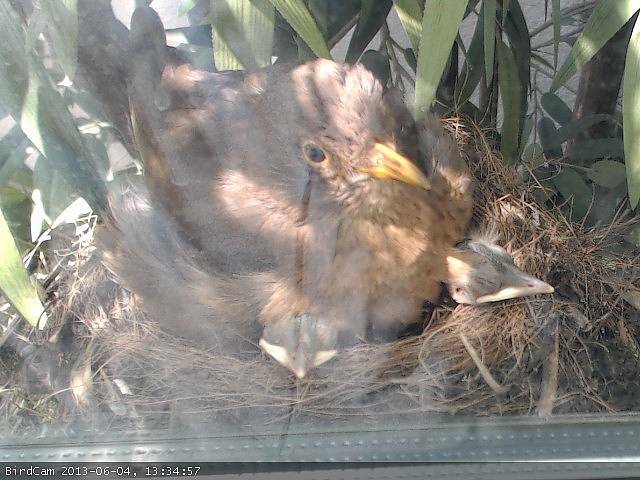 Around lunchtime seems to be the best time when a nice shaft of sunlight illuminates the nest for a short while. A crack has appeared in one of the eggs. 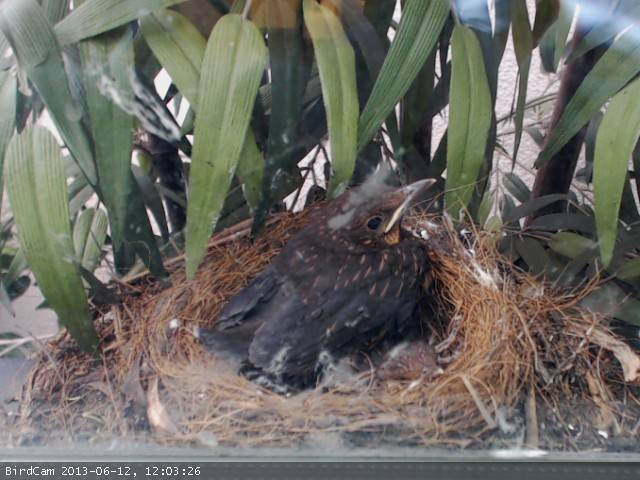 The father checking up on the nest. 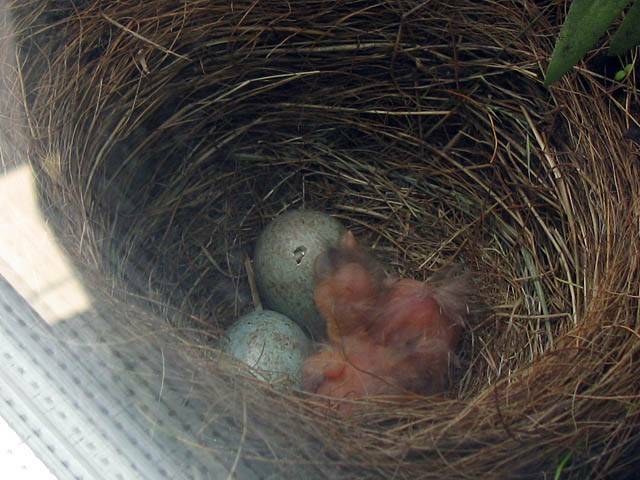 The first view of a newly hatched chick on Birdcam, a webcam set up in the office. 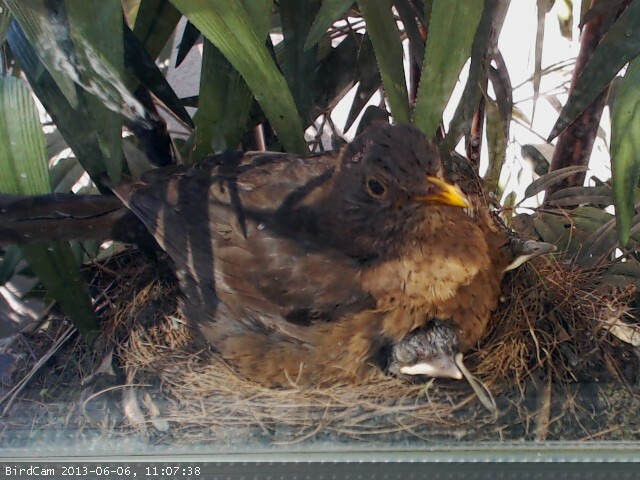 A moment earlier I saw mum fly off with a piece of shell and knew that was the moment the first chick hatched. 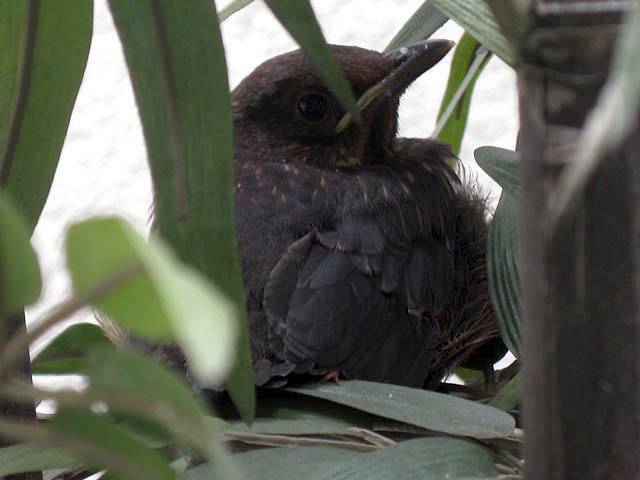 A newly hatched Blackbird chick. 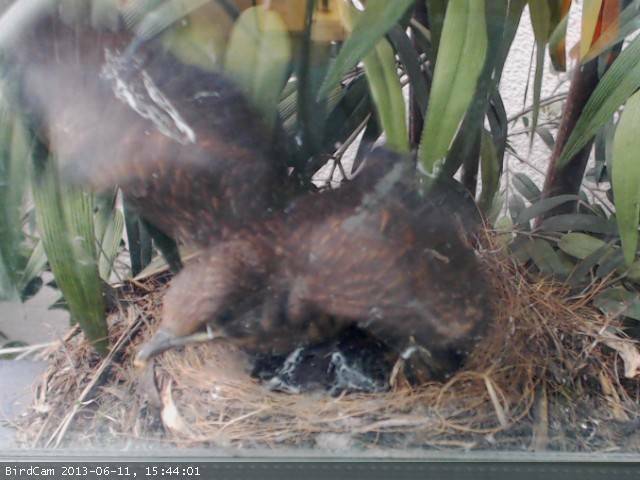 Mum flying off with a 2nd piece of shell as the 2nd chick hatches. I did see her eat some shell. I guess the calcium comes in useful. Born hungry! Eating eggshell. Barely out of its shell and already posing for pictures. 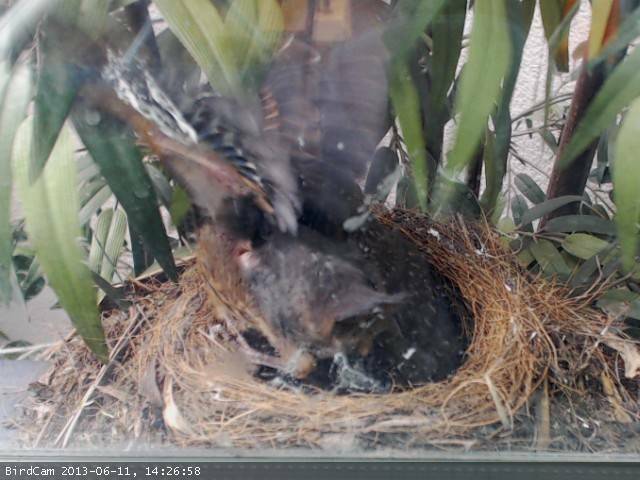 The father starting to feed the hatchlings. 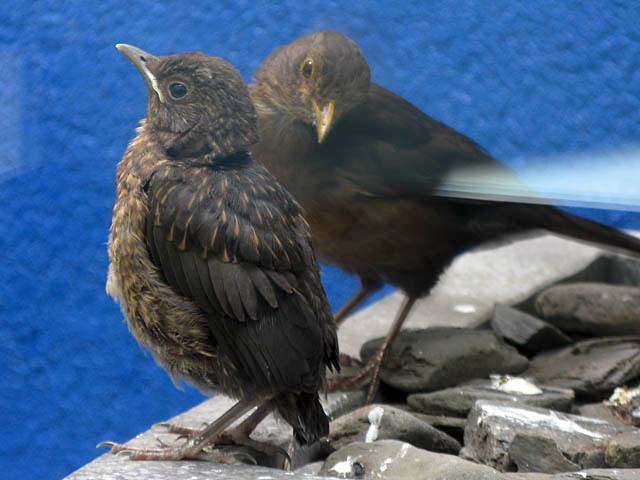 Two Blackbird hatchlings. 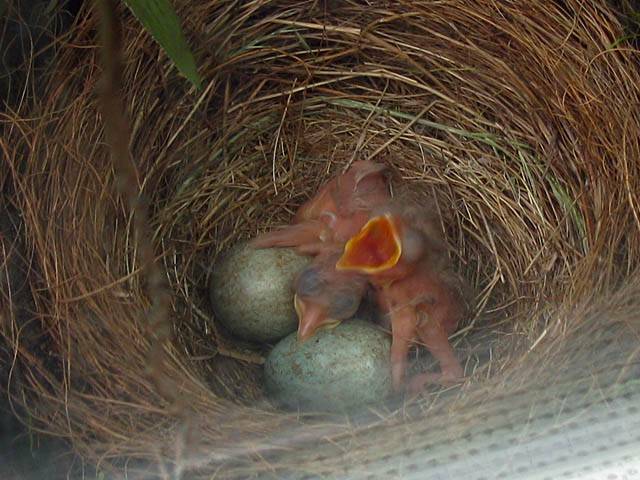 The 2nd one was the one out of the egg observed to be cracked in the morning. 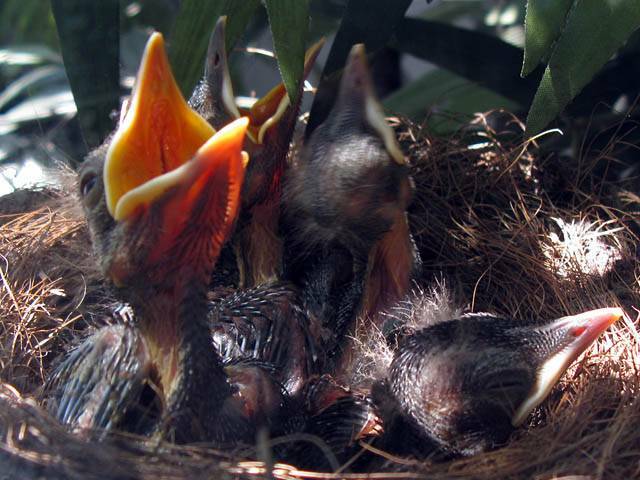 Feeding the hatchlings. 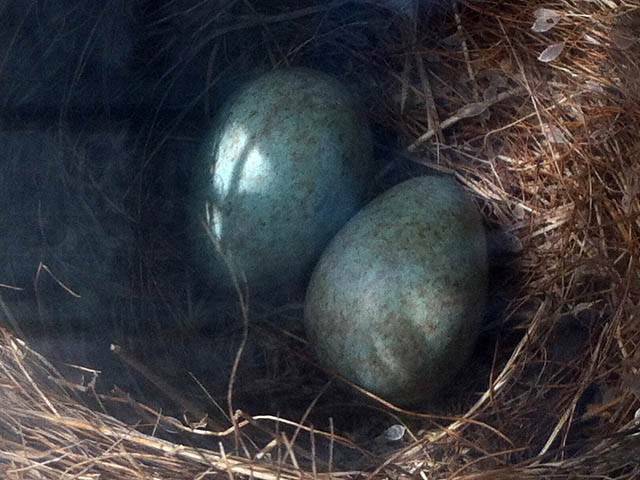 A hole appeared in the 3rd egg later in the day with a beak visible inside. 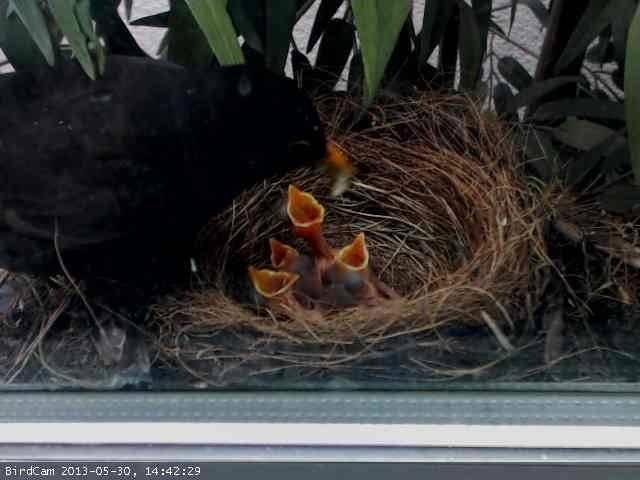 Feeding the hatchlings. 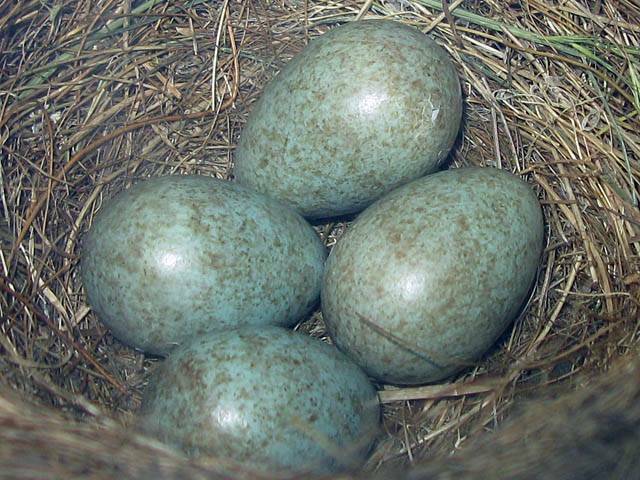 Hole visible in the 3rd egg. 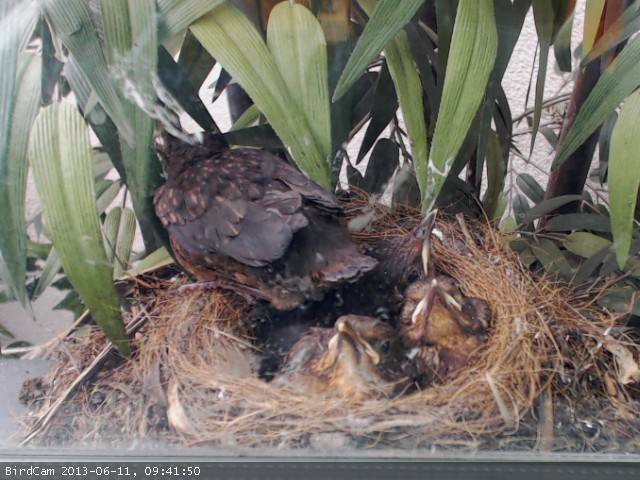 On 30th May there were indeed 3 hatchlings in the morning. 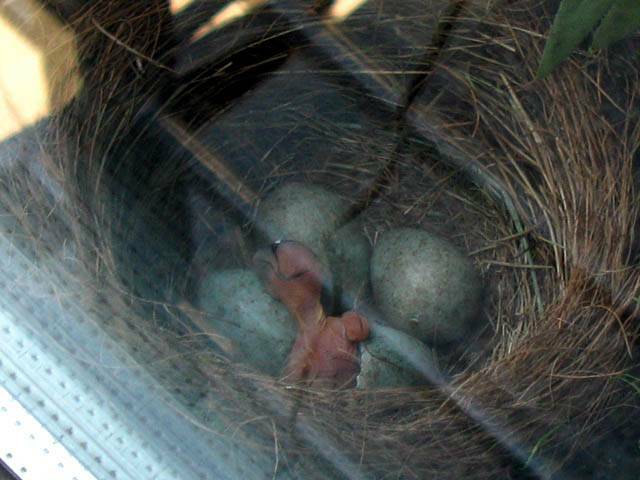 I guess the 3rd hatched overnight. 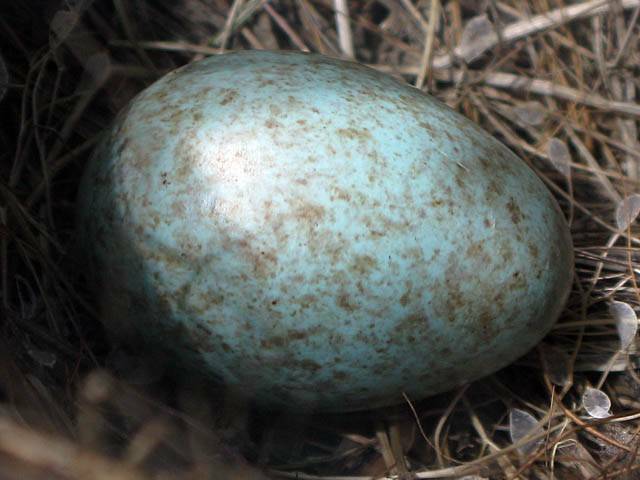 A crack was observed in the final egg, and that hatched around the 10:30AM mark. 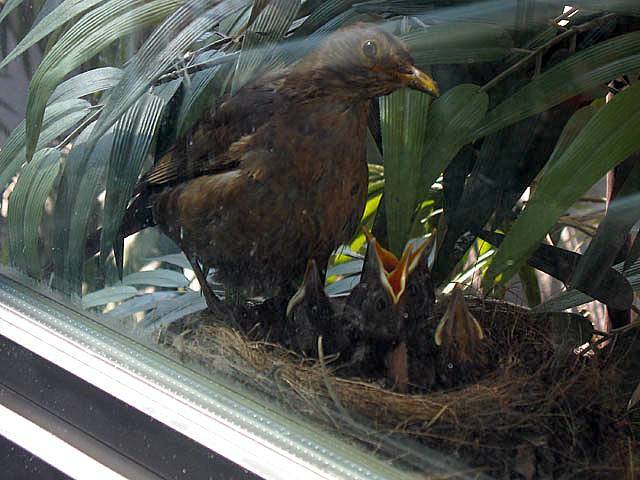 The mother was observed eating the final egg shell. 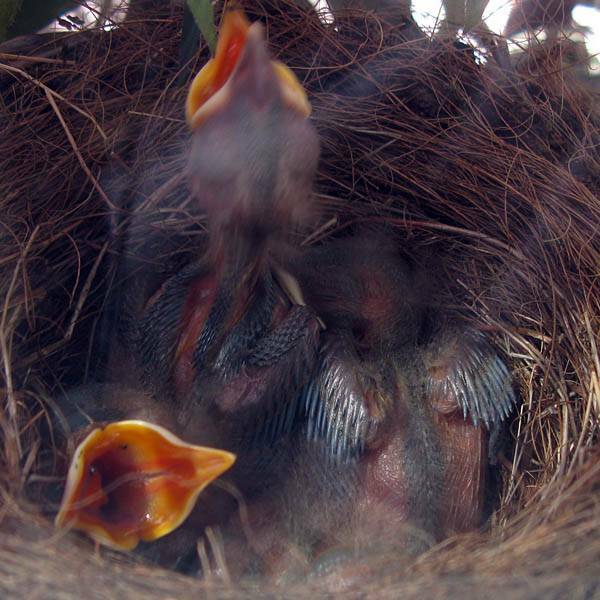 Now the nest contains 4 wriggling lively hatchlings, begging for food which both parents are bringing to the nest. 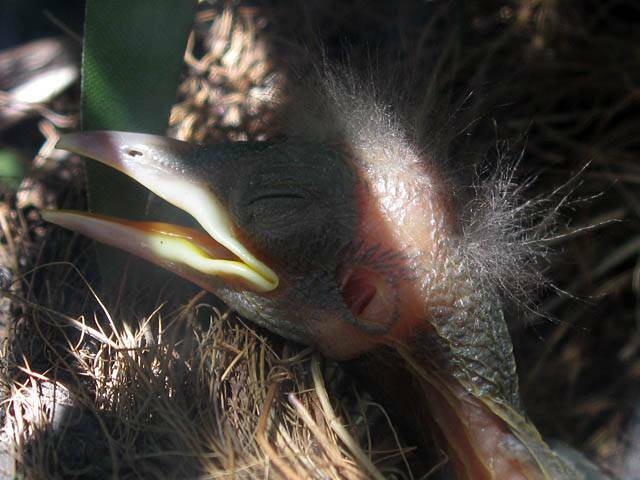 At one point the father brought a giant (by their standards) green caterpillar which it stuffed into the mouth of the first chick to open its mouth. The cycle continued. Mother would sit on the chicks for a while until a squawking male returned with a beak full of maggots, grubs, caterpillars, etc. 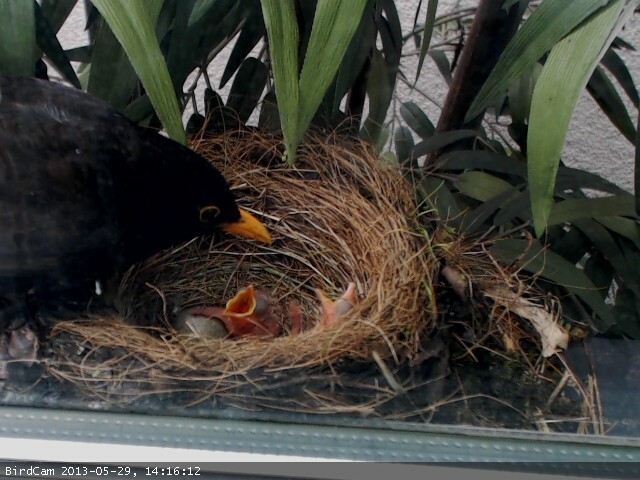 He then fed the chicks and looked over them while the mother went off to get food. 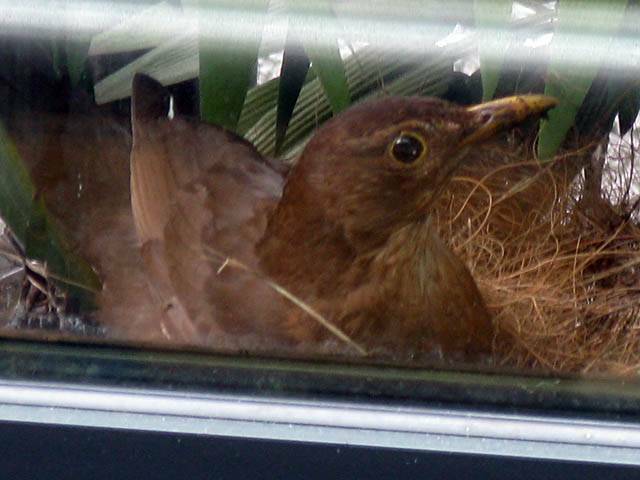 She then returned and sat on the nest. One less pleasant observation was that now and then a chick stuck its bum up and pood, and this was picked up by a parent and eaten! 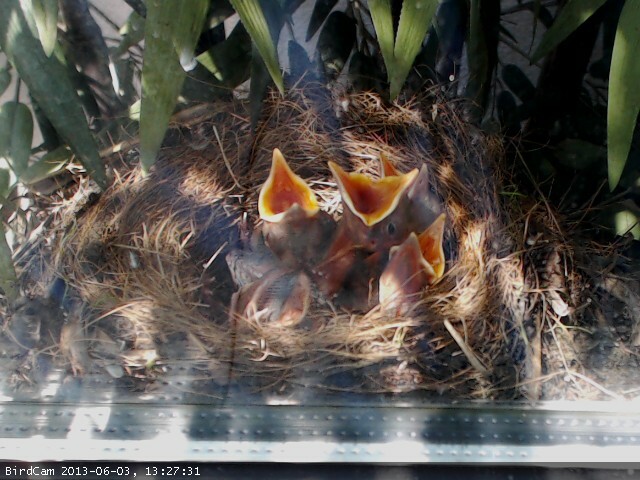 The few moments when the chicks were unattended were when I tried to take photographs with the main camera. 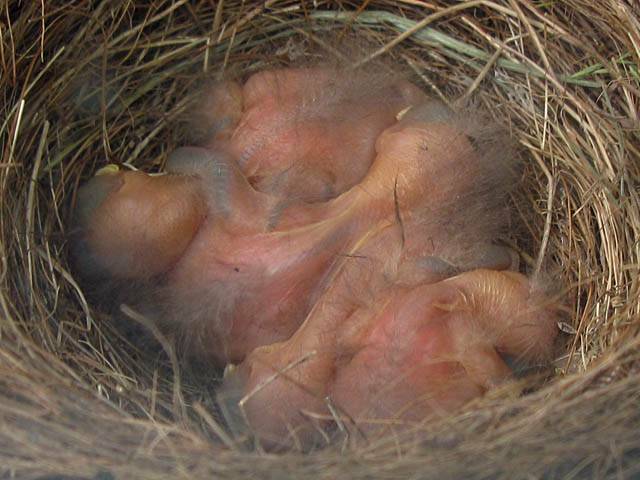 In just one day the older chicks have started to grow a layer of down and started to grow. I expect by Monday they will look quite different. 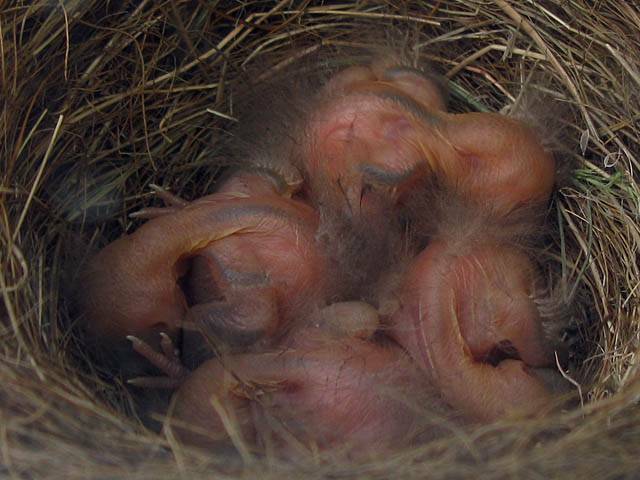 One more shot of the chicks huddling between feeds. 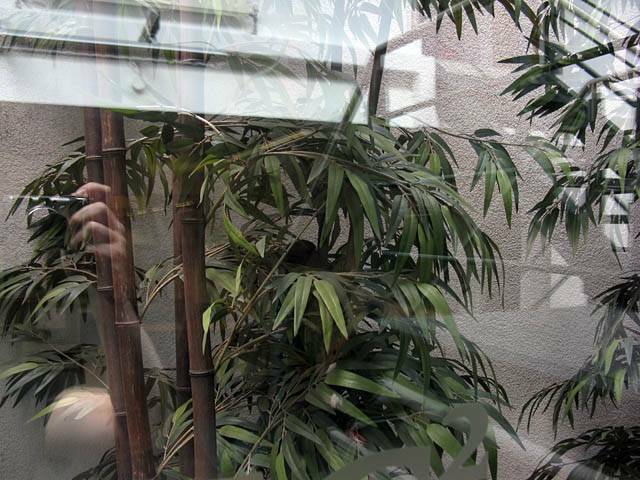 Birdcam in action. 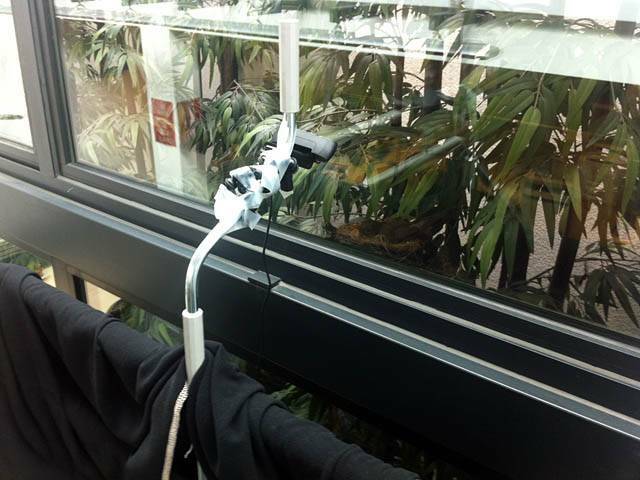 It is a Logitech C920 webcam attached to a gorillapod which has been mounted on top of a window pole, with tape stopping it from slipping. The pole is attached to the staircase handrail by string and more tape. The black cloth was draped over the rail to reduce the severe reflections, and worked a treat. 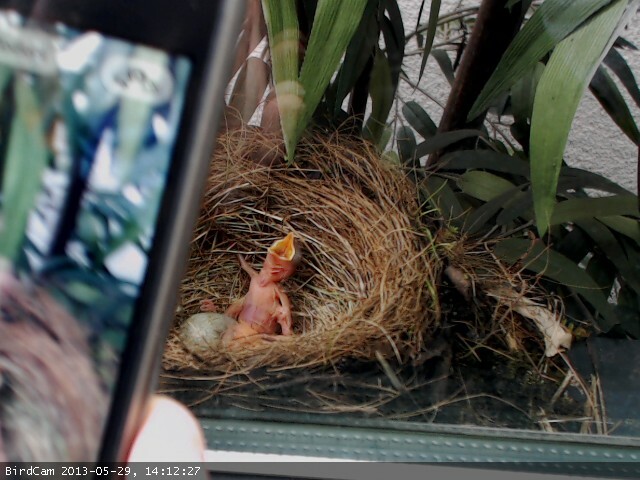 The webcam is attached to a PC downstairs running Yawcam software. Alas the webcam is only accessible from within the company network. Apparently it is a hit across the company, including in the head office in Hopkinton, Massachusetts. Feeding time. 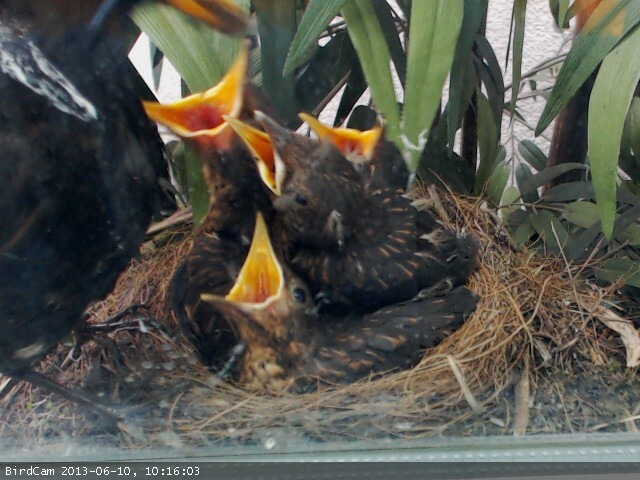 Birdcam spots Dad feeding the chicks. 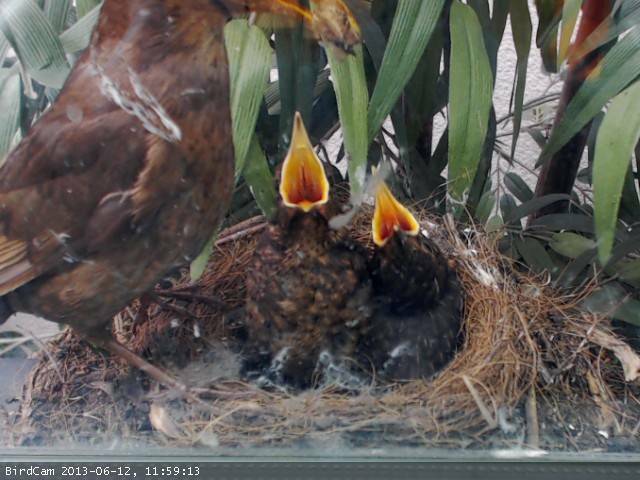 Mum brooding the chicks and having a yawn. 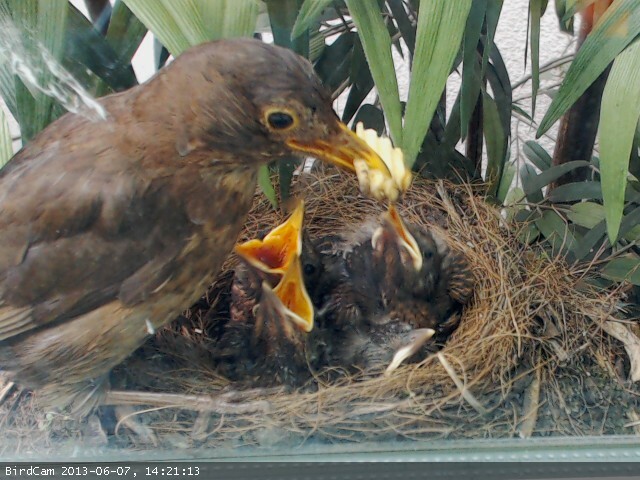 On Friday 31st May the same continued, with parents coming back and forth with food. 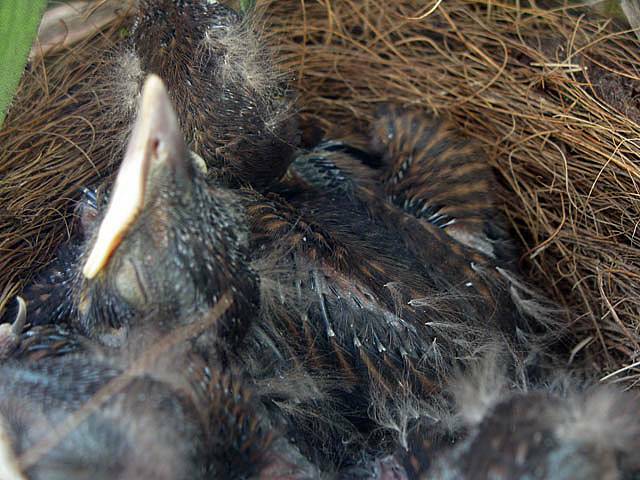 The chicks are growing fast and steadily growing lots of this downy hairs. 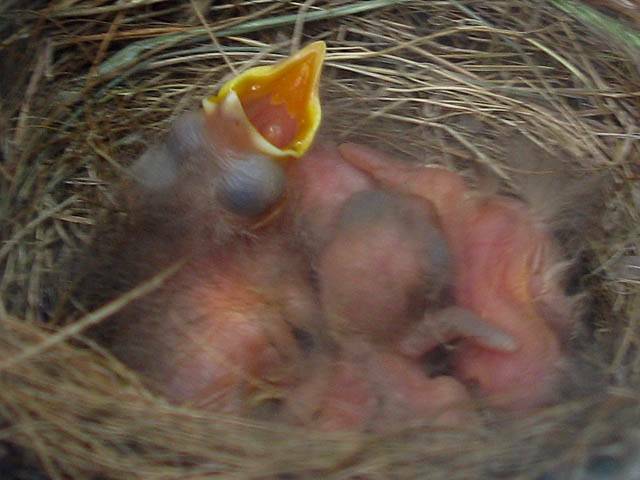 I expect by Monday they will look bigger and darker and maybe even open their eyes? We shall see. 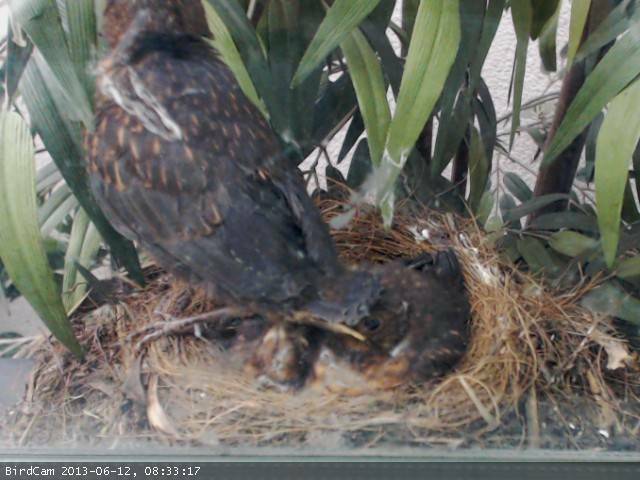 Looks like one chick is hugging its sibling... More views of the chicks resting between feeds. 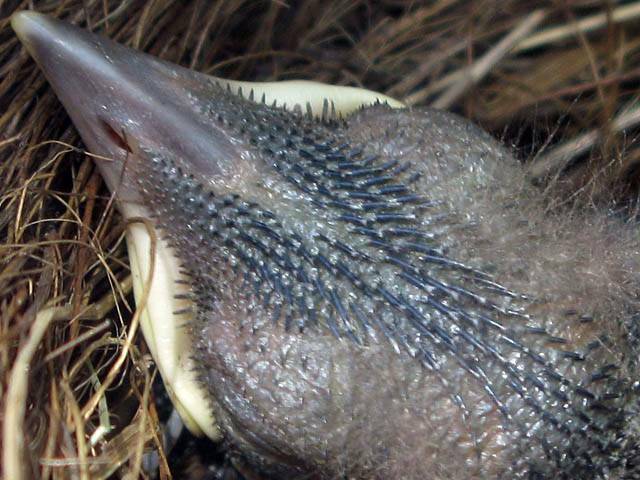 Closeup of one chick's head. 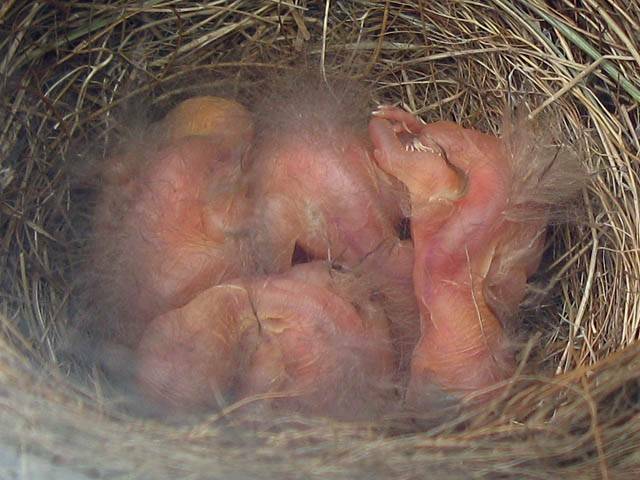 Another view of the chicks resting between feeds. 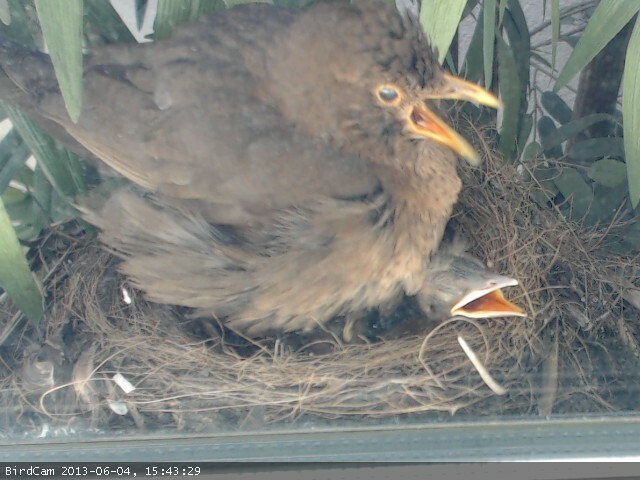 On Monday 3rd June, after the weekend, the chicks had changed considerably as expected. 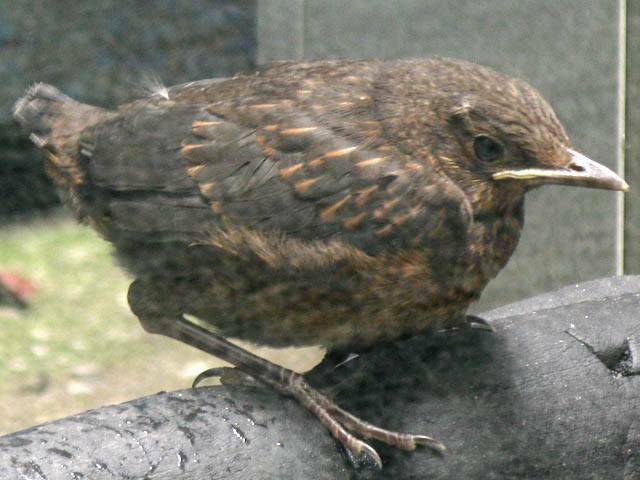 Much darker and bigger, flight feathers growing rapidly on the wings, and eyes just starting to open (most noticeable when being fed). 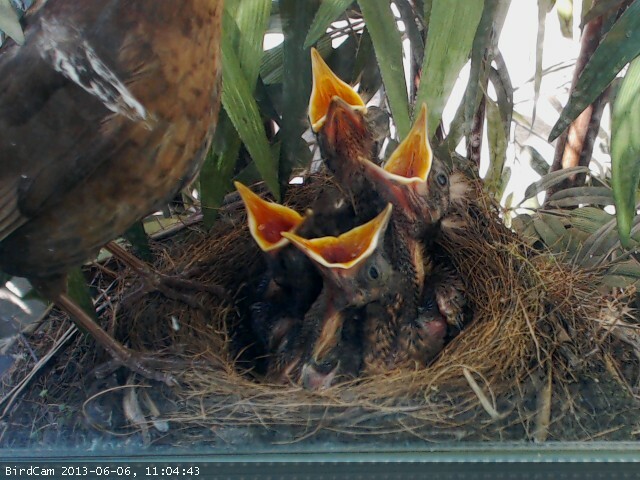 They were ravenous and poor old mum and dad were run off their feet bringing them food, food and more food. Now and then mum still sat on them. She was visibly higher up in the nest than last week, and couldn't sit still for long before a chick wriggled or poked a head out. 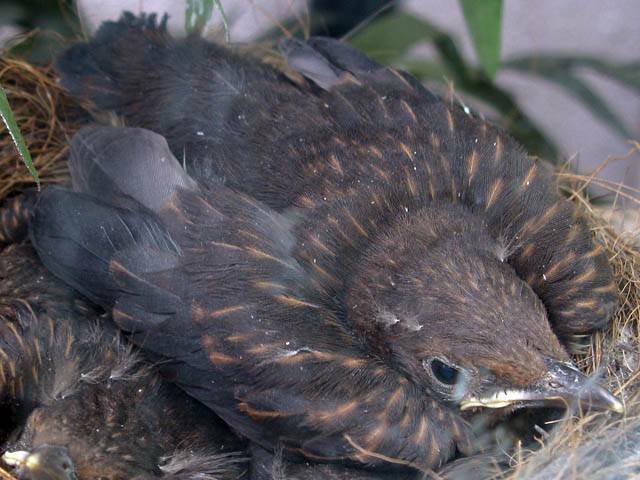 Throughout the week the chicks continued to grow bigger, more hungry, and started to grow their feathers. By the end of the week they were starting to look more like real birds, a far cry from the lumps of raw chicken look a week ago. 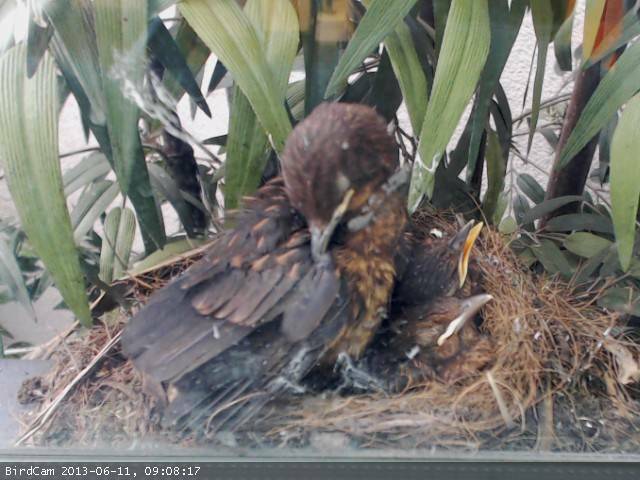 They were also preening the new feathers a lot and on Friday one of them had started to exercise its wing muscles. Eyes opening. 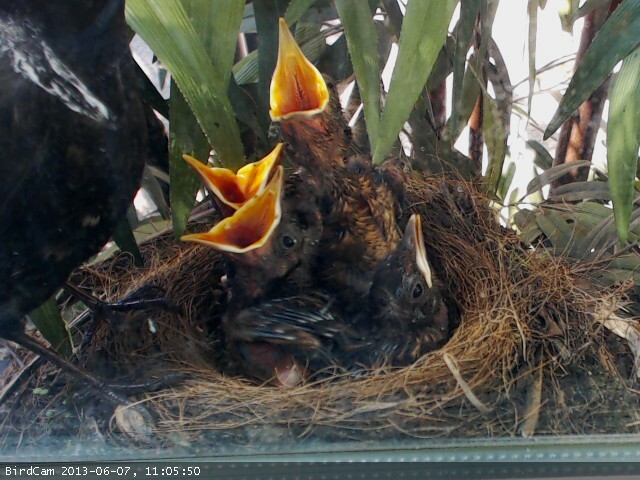 All 4 mouths open. Those 5 day old chicks haven't half grown over the weekend. 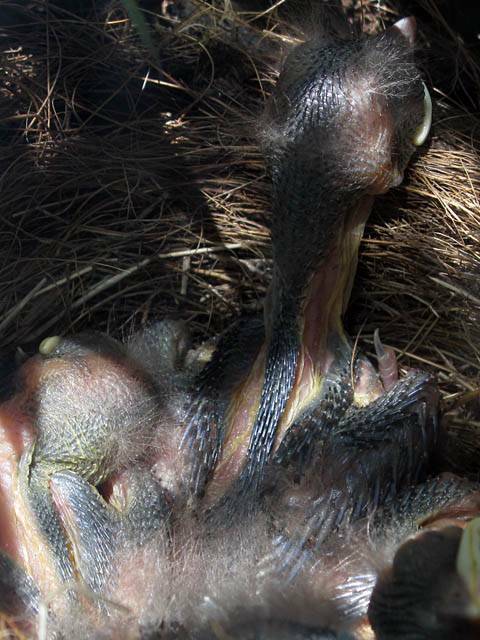 Darker, bigger, growing flight feathers, and eyes starting to open. 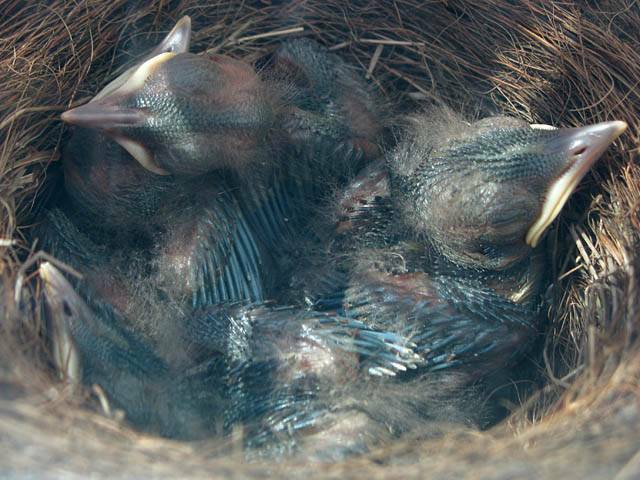 Closeup of the heads of two of the chicks. 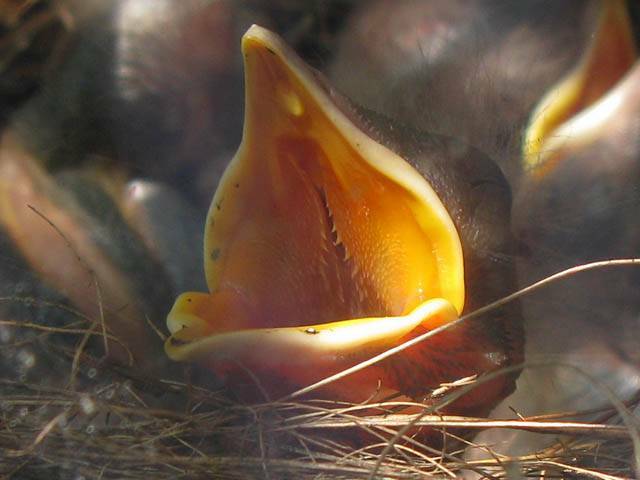 Closeup of the mouth of one of the chicks. Interesting roof of the mouth with those hooks. Could it be to ensure food can't escape once placed inside? 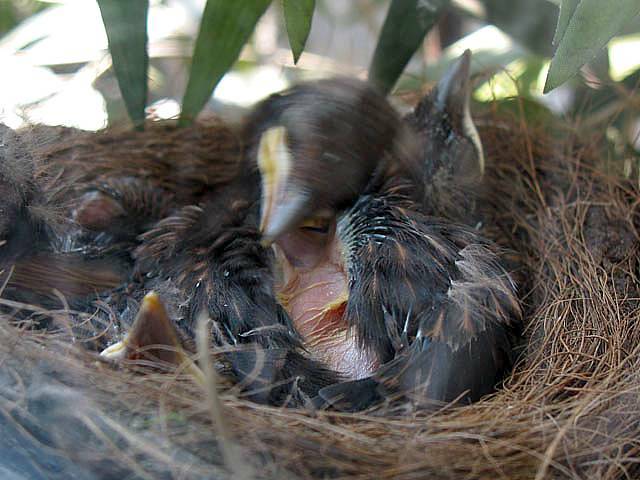 Another cramped looking view of all 4 chicks, looking right down one of their throats. Eyes opening. Eyes opening. Feeding time. Mum brooding the chicks. 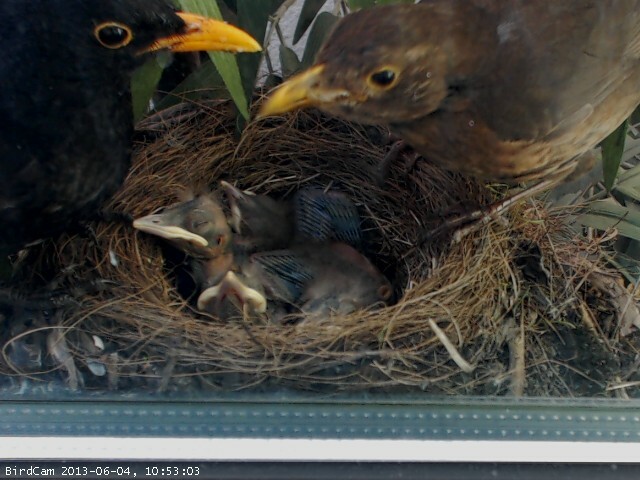 Notice how much higher she sits now with bigger chicks underneath her. 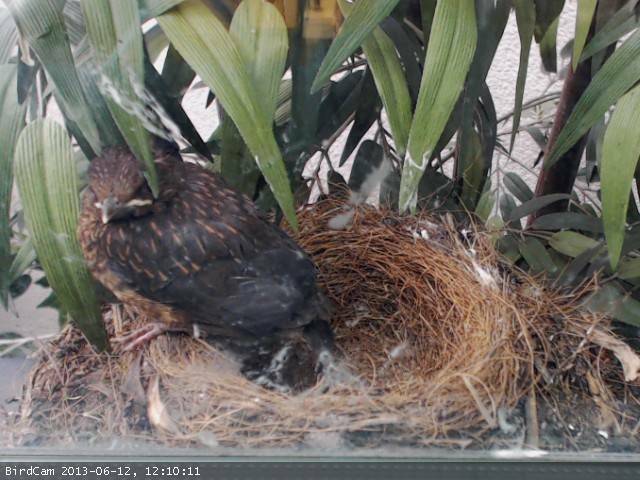 Both parents at the nest. 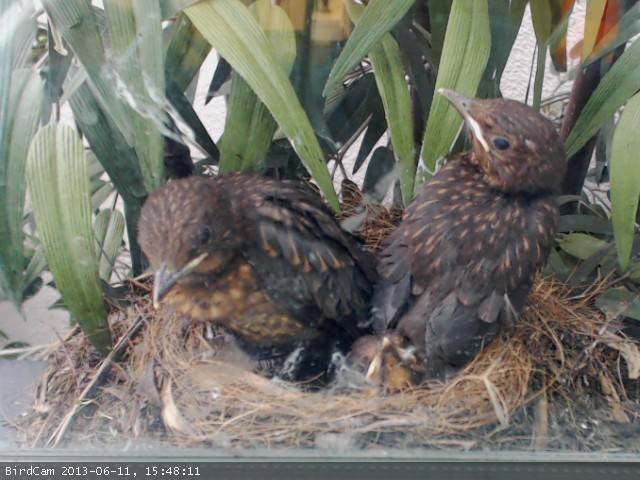 Feathers growing nicely. 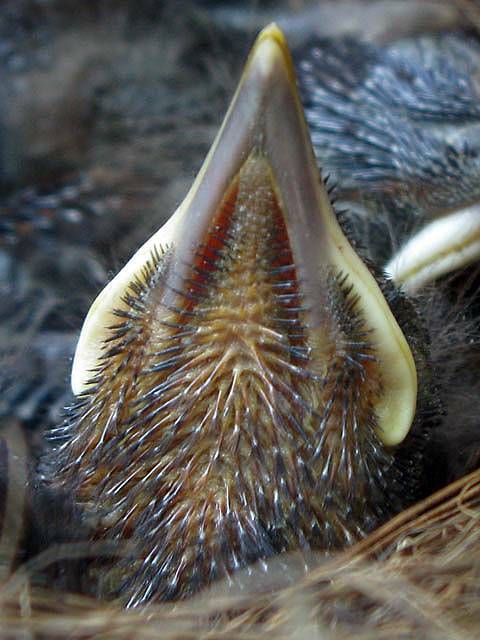 Closeup of a head. 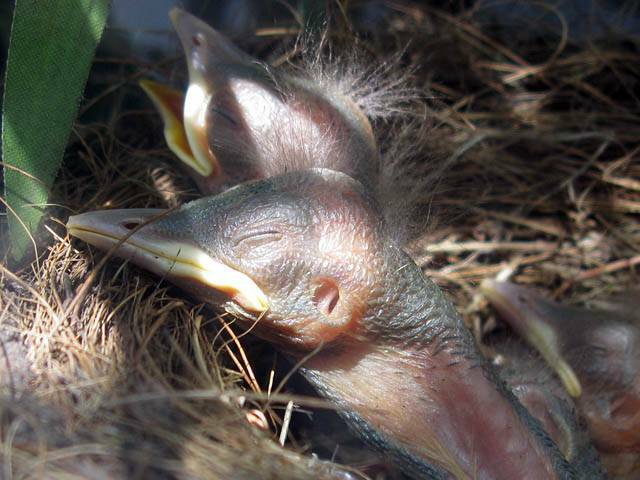 Feathers growing across the ear holes and on the head. Looks like stubble... Feeding time. 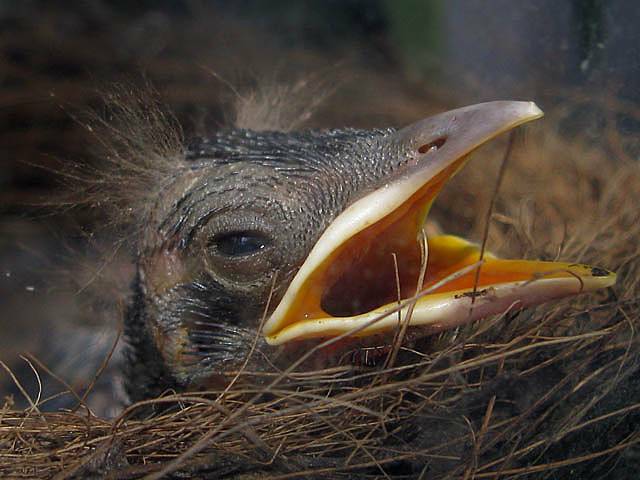 Closeup of the head of a chick. Looking at the chicks you can see the feather 'stubble' growing nicely from the head, down the neck to the wings and back. The youngest chick slightly behind the others but still doing OK. Mum brooding the chicks. Head stubble closeup. 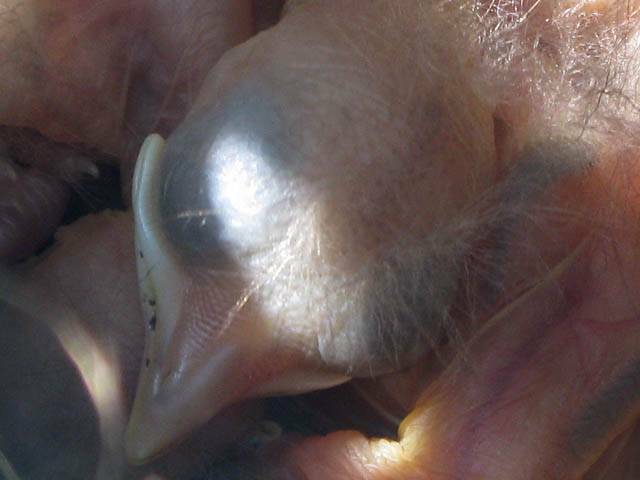 Closeup of the head of a chick. 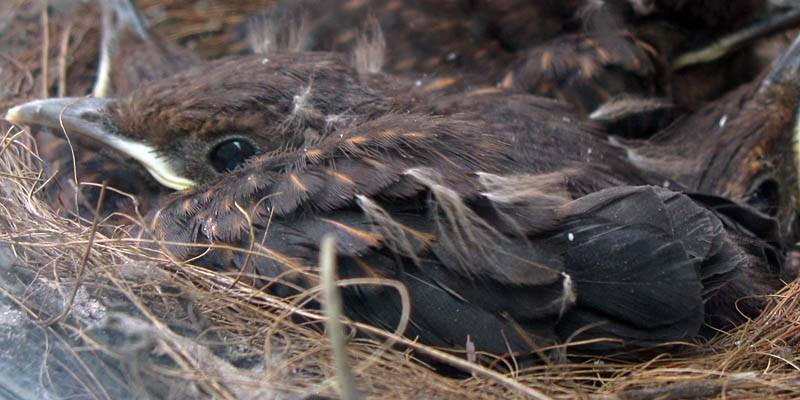 Mum still brooding the chicks who often now stick their heads out from under her. Mum cleaning the chicks? A curious capture. It looks as if mum just got jabbed up the bum by a chick? 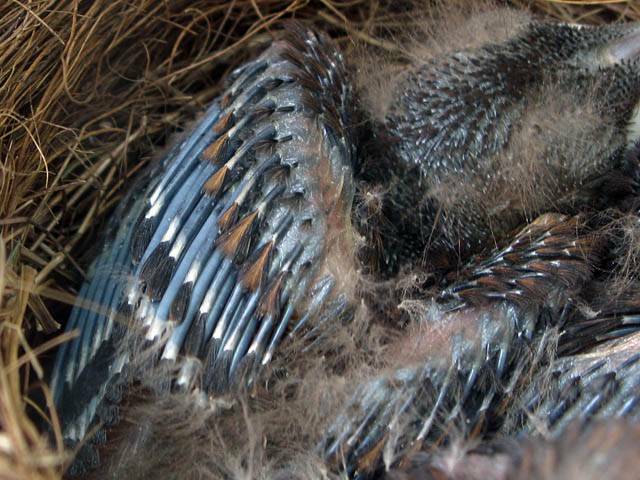 Wing feathers starting to emerge from the barbs that have been rapidly growing as the chicks continue to be fed regularly. Dad feeding the chicks. At last I got a closeup of a head with open eye. 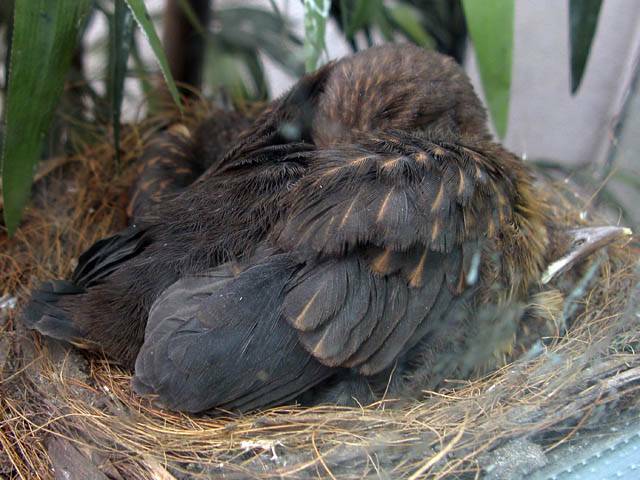 They still keep their eyes closed most of the time when resting between feeds. 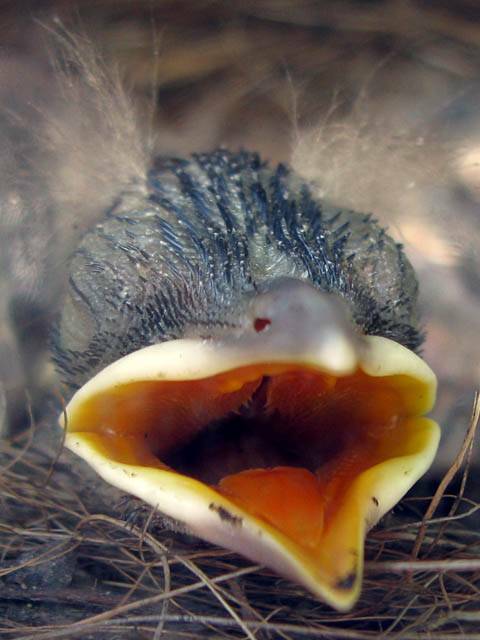 Another closeup of a chick raising its head for feeding. 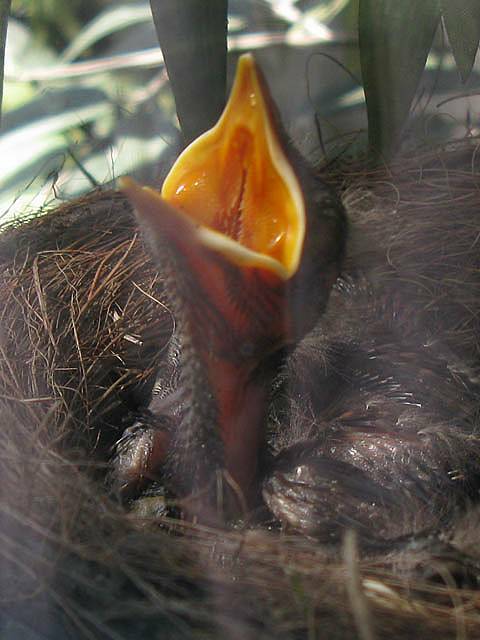 Looking down the mouth of a week old Blackbird chick. 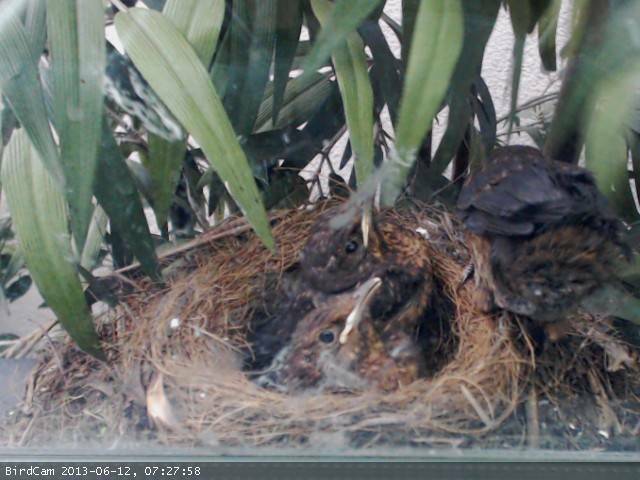 Look how long the feather barbs are getting now! 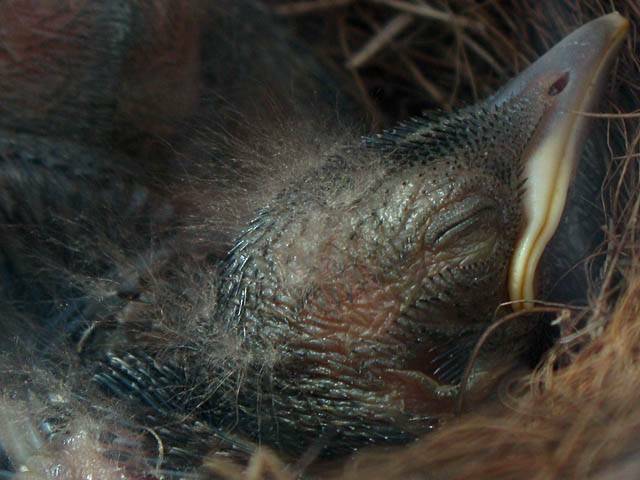 The chin of an 8 day old Blackbird chick. Feeding time. Mum brooding the chicks. 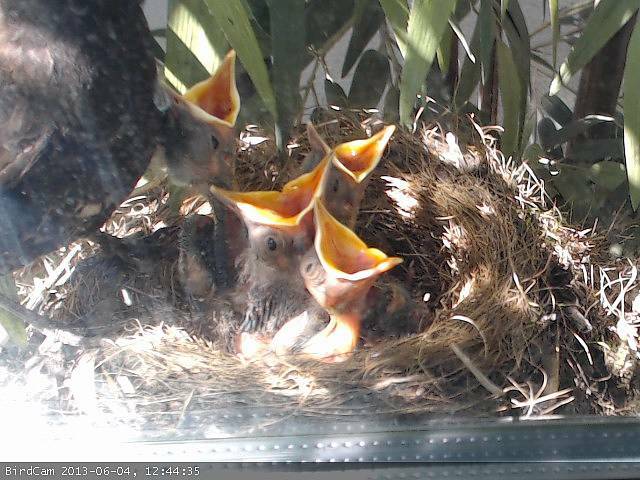 Feeding time again. Another head shot. I like its mad professor hairstyle. Feathers fluffing out nicely. Feeding time. 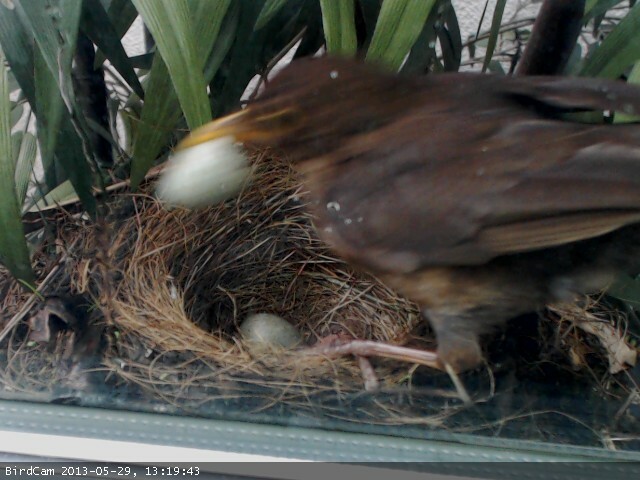 Mum returning to the nest. Preening the newly grown feathers. Feeding time. 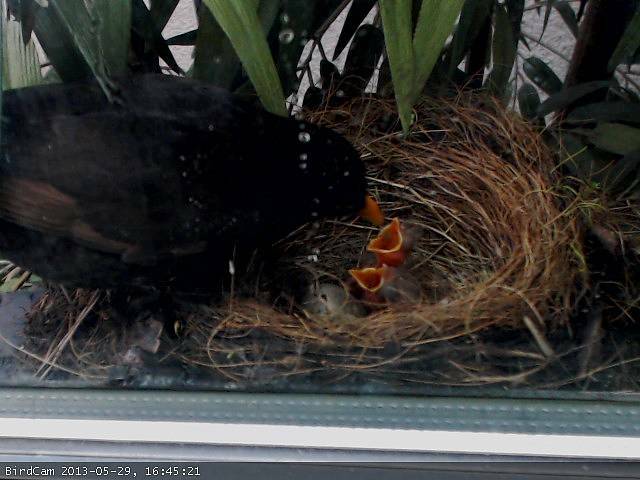 Mum trying to feed the chicks a crisp. It won't fit, but she keeps repeatedly trying. 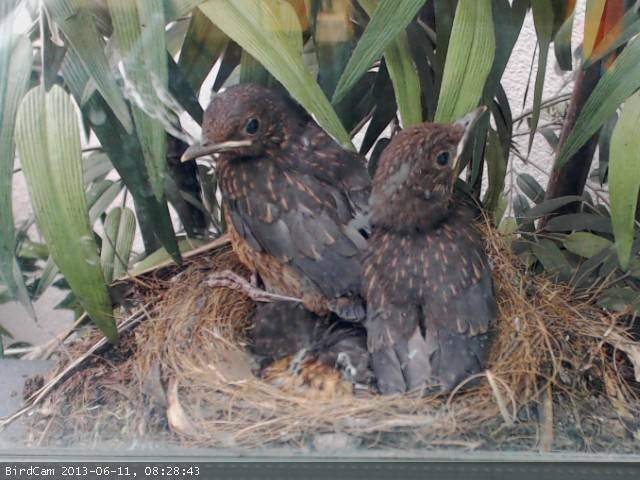 At 9 days old are these chicks starting to get close to fledging? 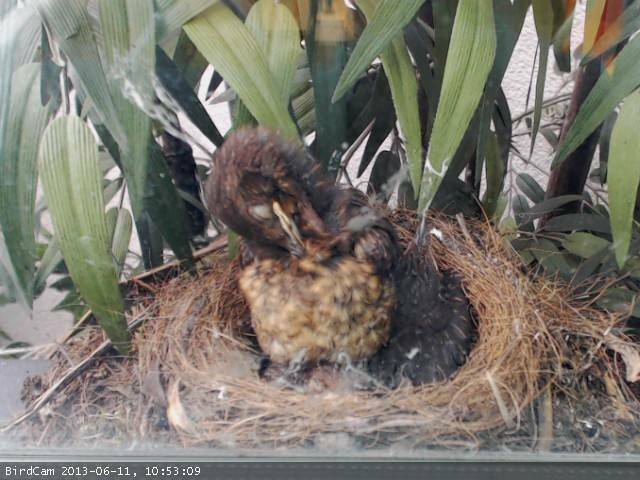 Preening and starting to exercise wings. 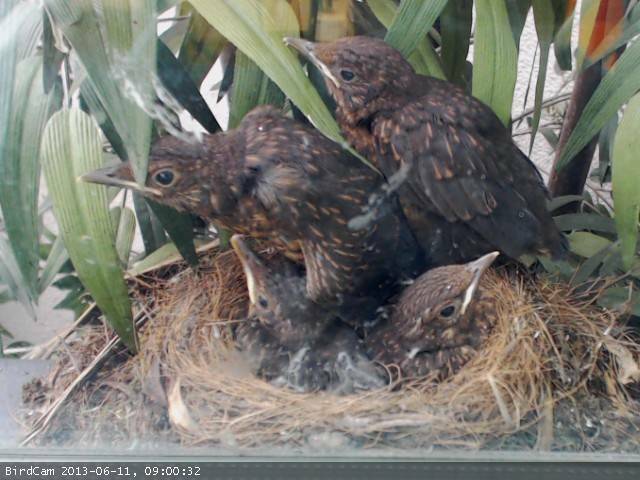 On Monday 10th all 4 chicks were still in the nest, and looking like miniature adults now. 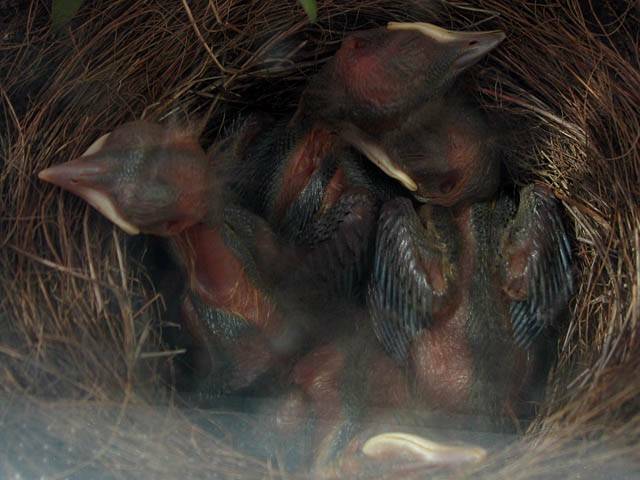 With their juvenile red, brown and black feathers they looked quite pretty. In between feeding and resting they preened a lot and exercised their wing muscles. 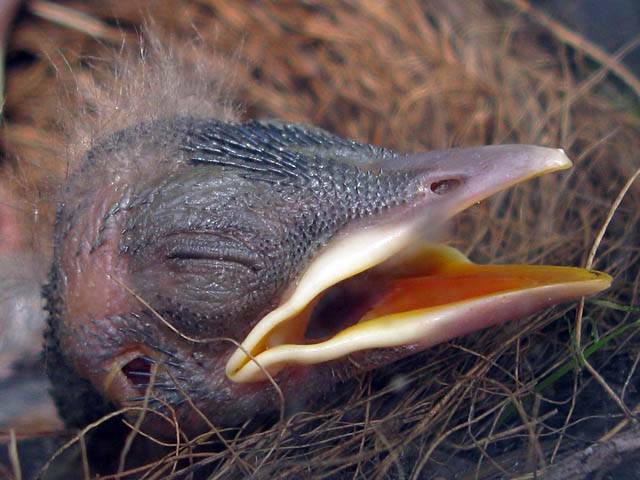 At one point I thought one chick was going to fall out of the nest. 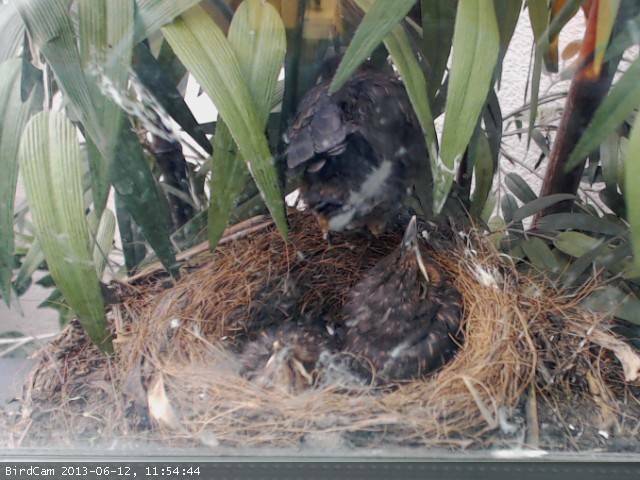 But somehow they still fitted in and mum still brooded them a bit. 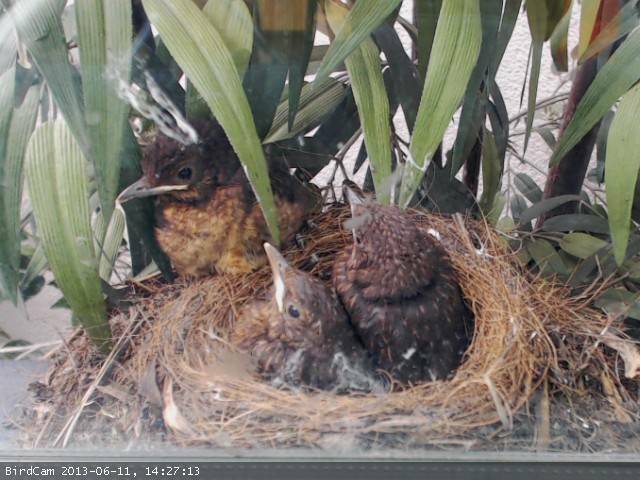 The chicks are looking more and more like adults now with their newly grown feathers looking almost complete (albeit missing the long tail feathers). Feeding time. 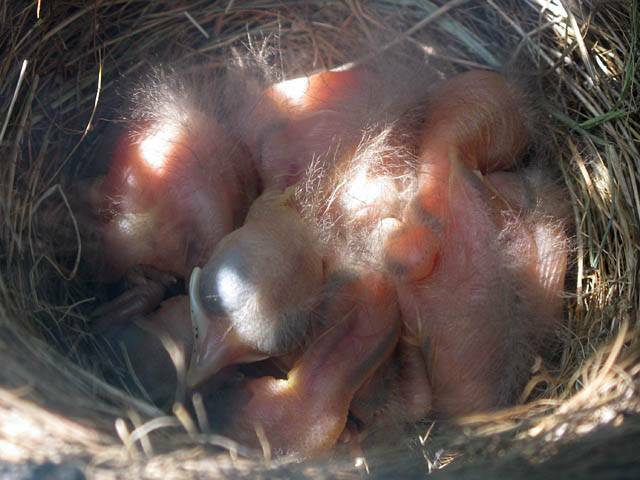 Closeups of one of the chicks lying on top of its siblings. 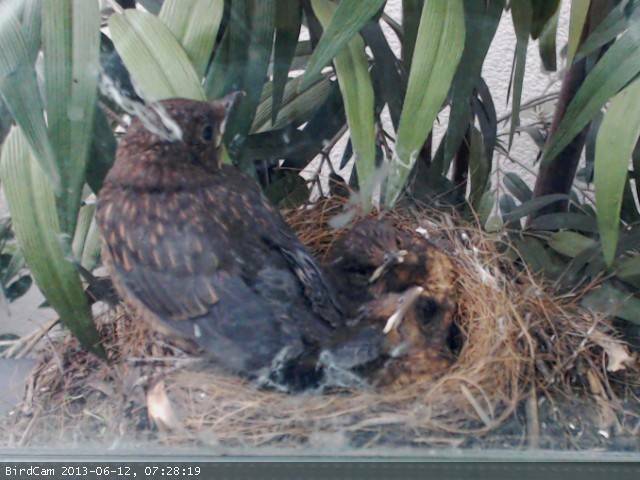 Mum is still brooding the chicks now and then. But there isn't much room there any more. 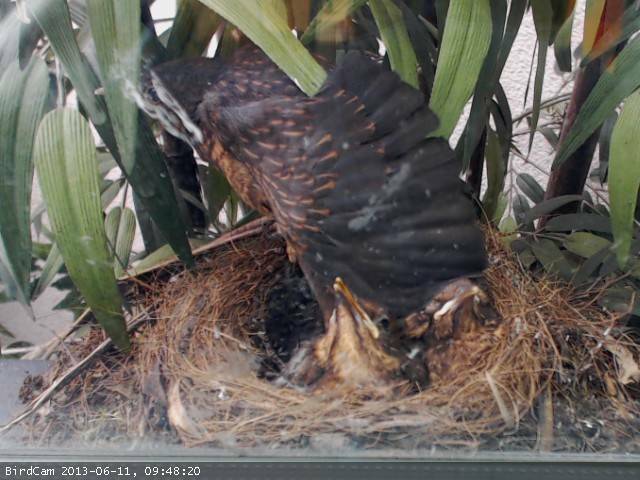 Some great webcam captures of wings outstretched. They almost look airworthy now. Exercising the wing muscles. 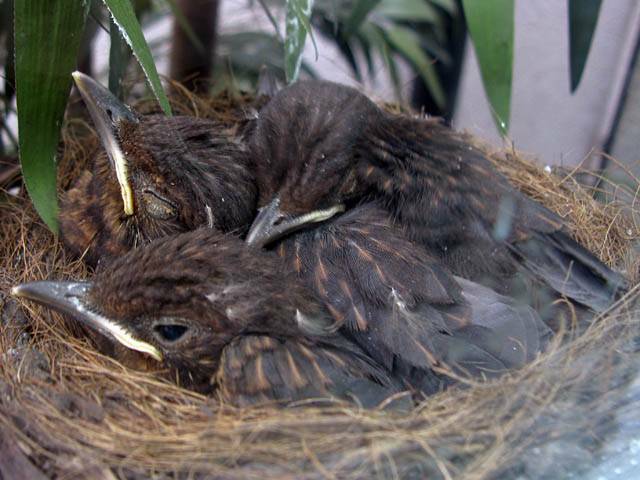 Tuesday 11th was fledgeling day! All morning the chicks had been getting increasingly restless, preening their feathers and stretching and flapping their wings. 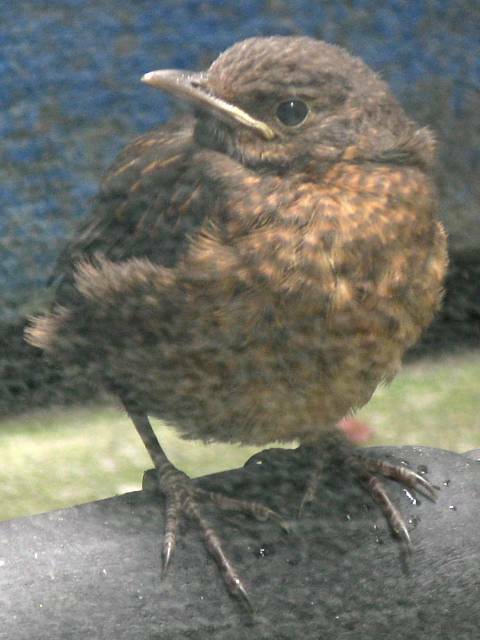 Then one chick hopped out of the nest onto the window ledge before hopping back in. 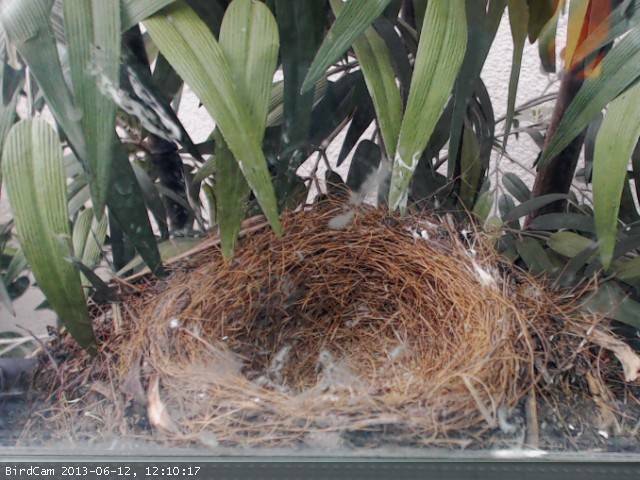 A short while later we saw it go over the nest wall to the back and disappear from the webcam view. 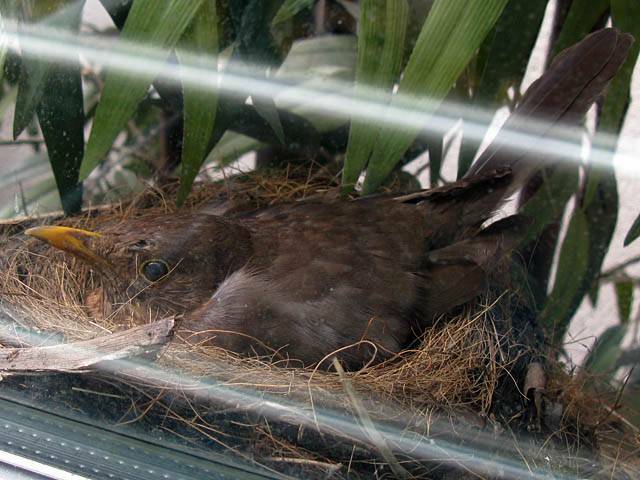 A short while later it was seen on a branch just below the nest. It eventually found its way to the ground safely. It can barely fly, and is rather clumsy, but learning fast. 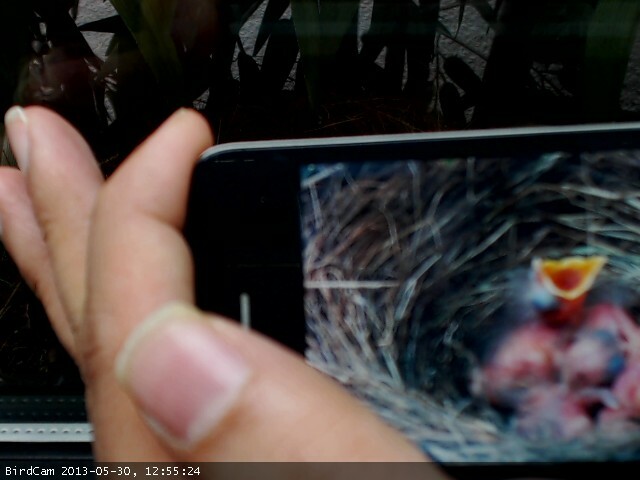 I saw mum feed the chick on the ground near the aircon unit. 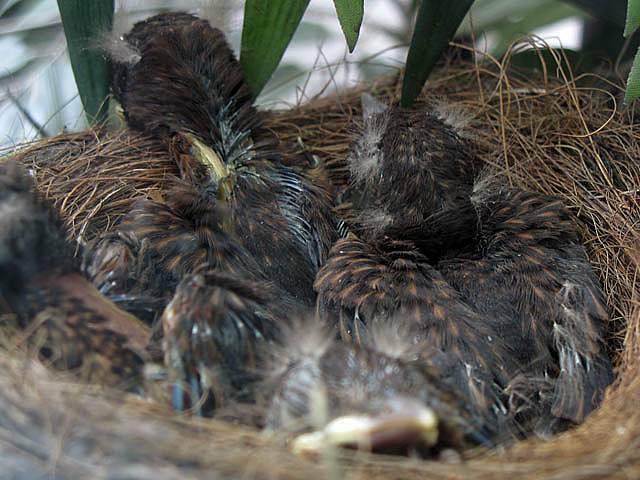 The chicks in the nest meanwhile were also restless. One chick stood up on top of the nest rim several times during the afternoon but never seemed quite bold enough and retreated back into the nest. The 3 remaining chicks were still in the nest when I left at 5pm, and seemed to be enjoying the extra space left by the fledged chick. Two chicks getting ever more restless and getting up. 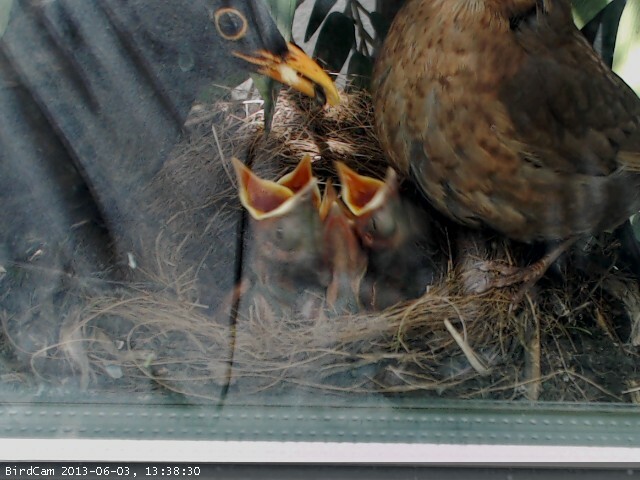 Meanwhile mum still comes to feed the chicks. Preening feathers. 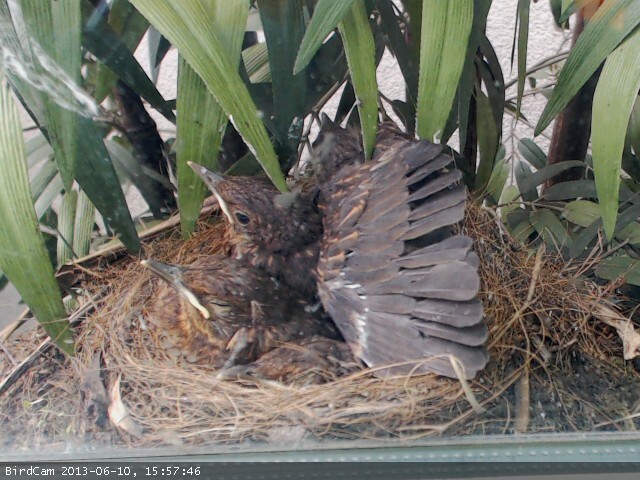 Having a snooze on top of its siblings before fledging. 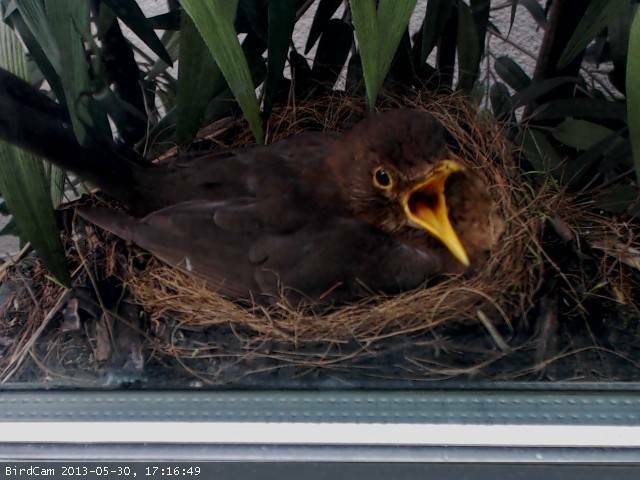 The webcam caught the first chick hopping outside the nest onto the window ledge before popping back in and having a stretch. 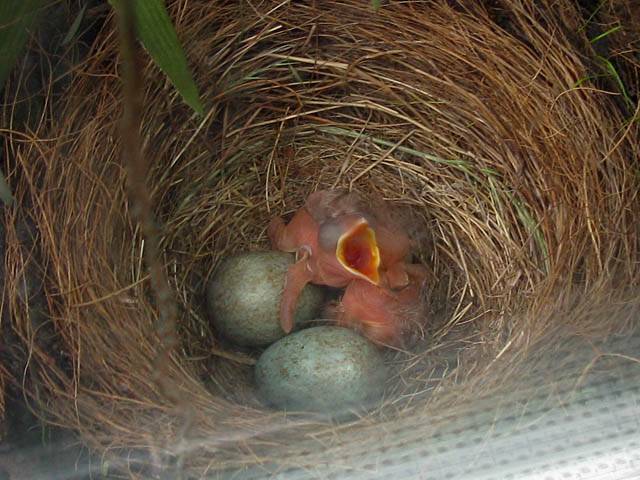 The moment the first chick left the nest for good. 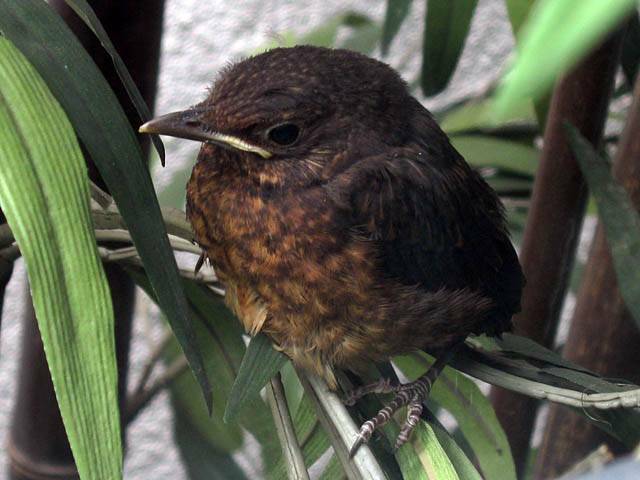 Sat on a branch below the nest just after fledging. 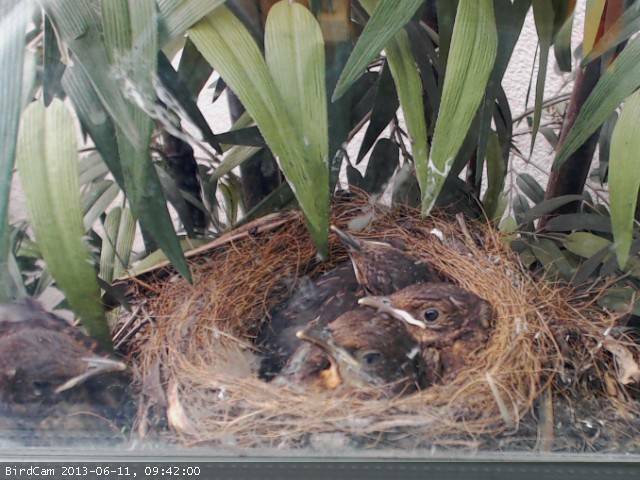 The other chicks enjoying the extra space in the nest. 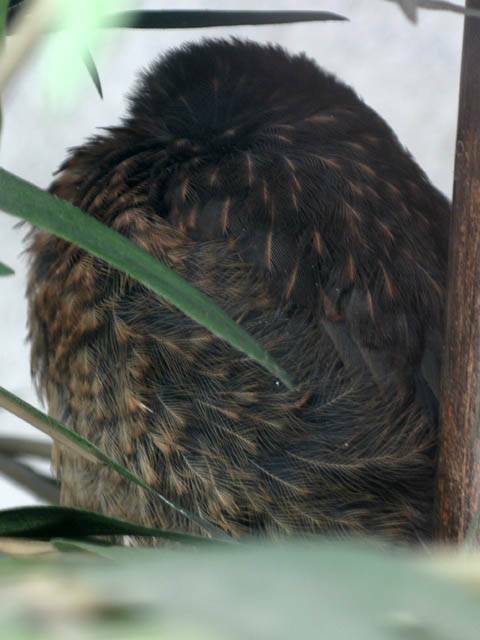 Preening chest feathers. The first chick exploring its new environment. Here on a pipe next to the aircon unit. Shame about the window reflections. 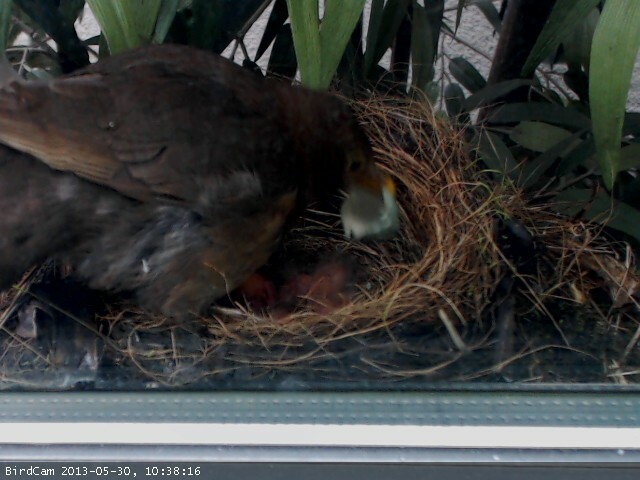 Now the 2nd chick gets up and has an explore. 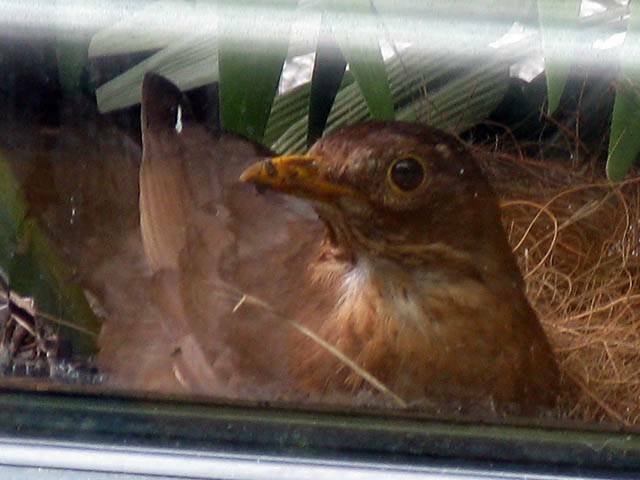 But despite briefly stepping outside the nest it comes back in. Chick 2 exercising wing muscles. Chicks 2 and 3 getting up to look around. 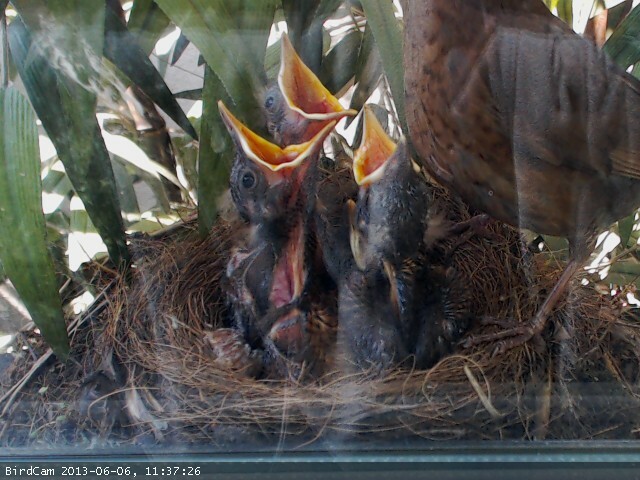 On Wednesday 12th I wasn't in the office, but I was able to review the webcam screen grabs. 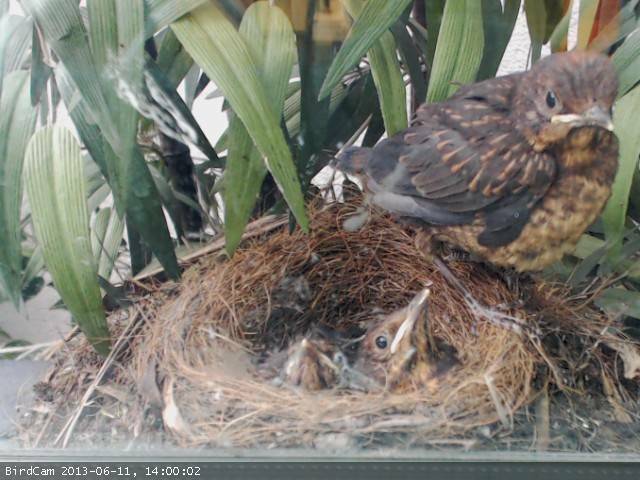 As expected the remaining chicks all fledged within 20 minutes of each other at lunchtime (11:54, 12:03 and 12:10). 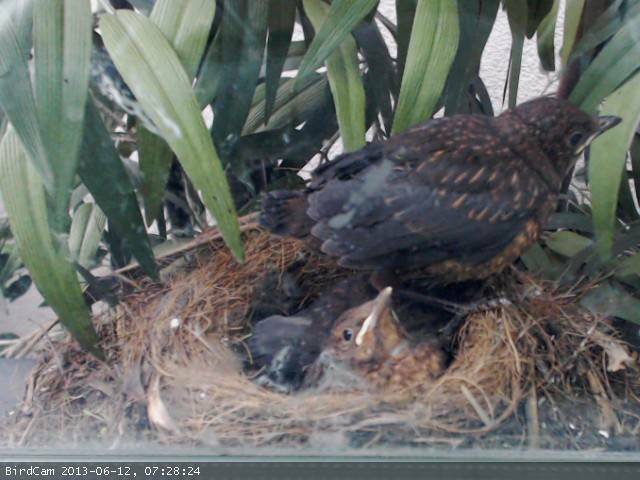 Chick 2 had been seen to leave the nest and the return a few times during the morning before it finally left for good. 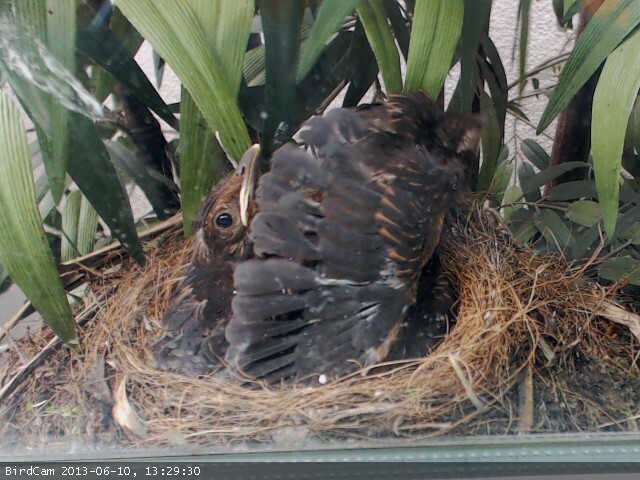 Then the 2 remaining chicks followed their bolder siblings out of the nest soon after. 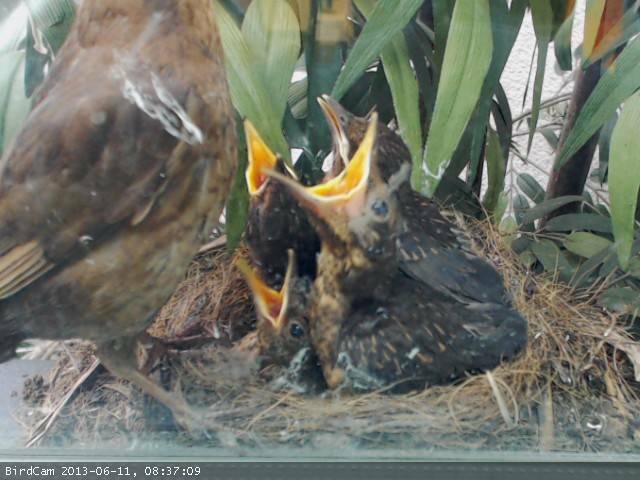 So this is the end of the nest story. 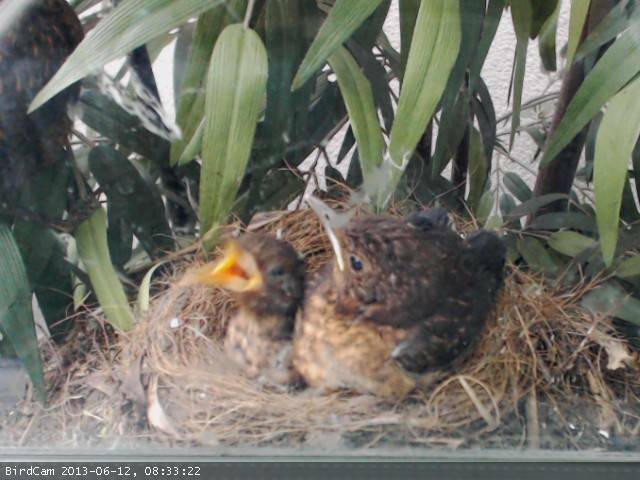 The chicks have successfully been reared to the point of fledging right in front of our eyes. 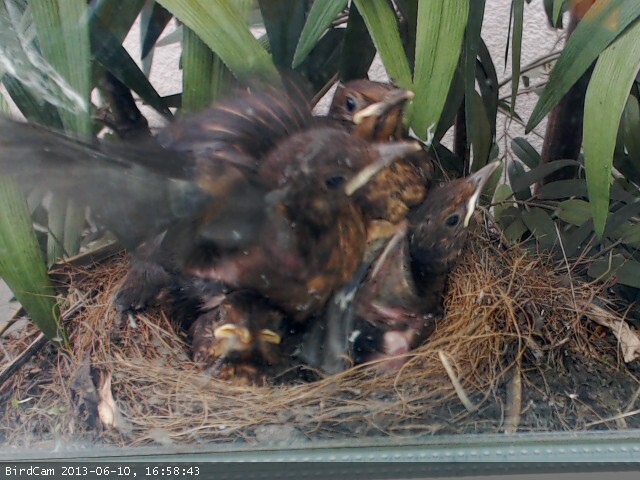 Now it will be much harder to follow them as they disperse away from the nest. 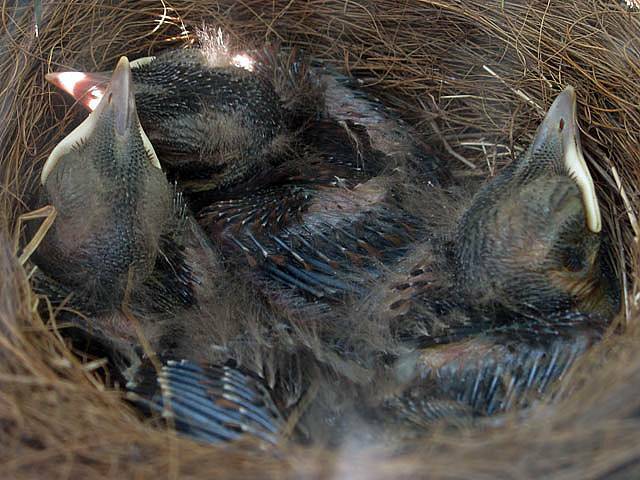 It is possible they might stay close by for a while, but as they learn to fly they will soon vanish for good. This was an amazing opportunity to see nature in action. 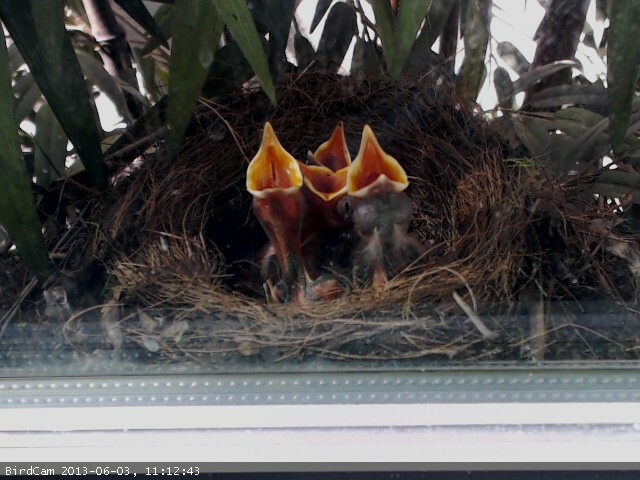 Springwatch eat your heart out! Chick 2 exploring outside the nest but returning. 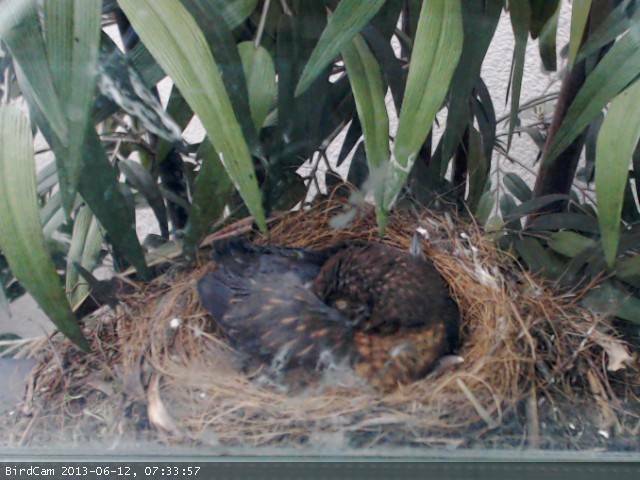 Chick 2 snoozing after all that excitement! Chick 2 exploring some more. 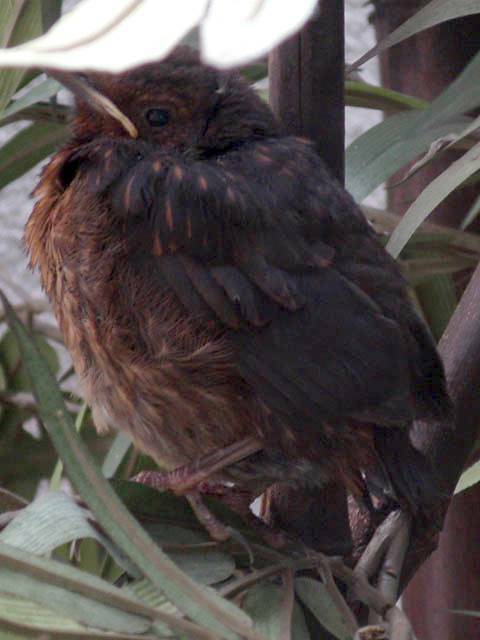 Chick 2 stepping onto a branch before returning again. Chick 2 leaving the nest for the last time. And then there were just 2 chicks left. 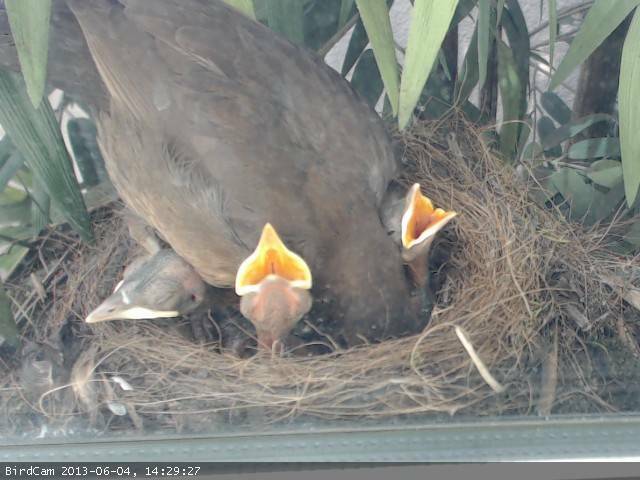 Mum feeding the remaining 2 chicks. The moment chick 3 left the nest, leaving just 1 chick remaining. 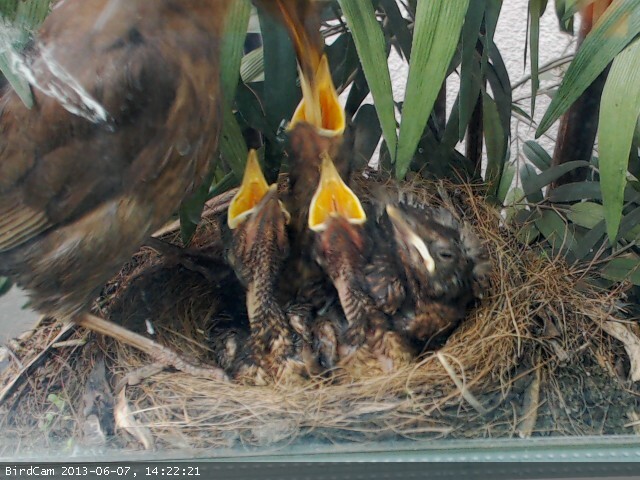 The moment chick 4 left the nest, leaving it empty. I was back in the office on Thursday 13th. Early in the morning one chick was seen running around on top of a wall high above the nest behind a layer of spike strips meant for stopping pigeons. It ran back and forth several times before bumping into the side of a spike. It bounced backwards, fell over and then scrabbled back up onto its feet again before flying up and over the top of another wall above and vanished. I guess that was one of the two older chicks bringing a comical start to the day. What I guess were the two younger chicks hung around closer to the nest in branches of the fake trees (one was on the ground and then flew up onto a branch). 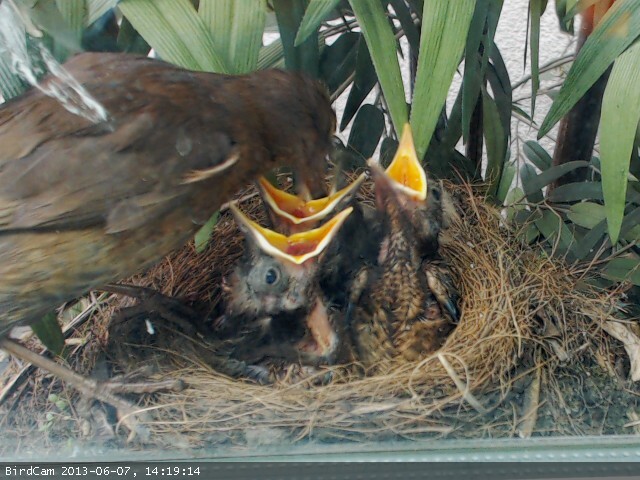 Periodically the parents came and fed them both in turn. They seemed quite happy lazing around, having a snooze. Photography was a challenge as light levels were very poor. But I got some half decent shots. 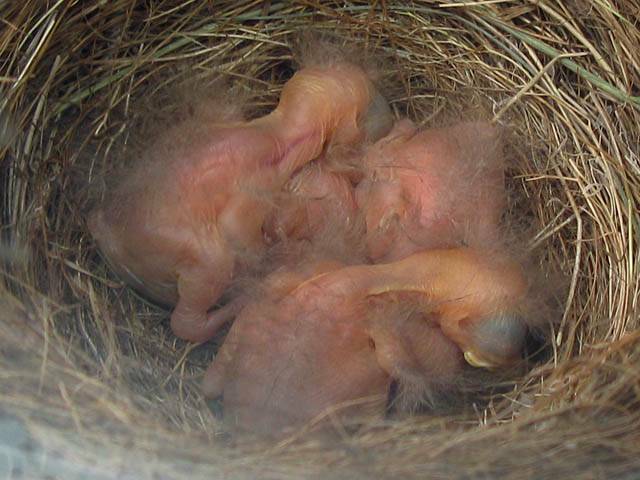 All the while they were growing rapidly, almost as big as their parents now but just lacking the long tail feathers. 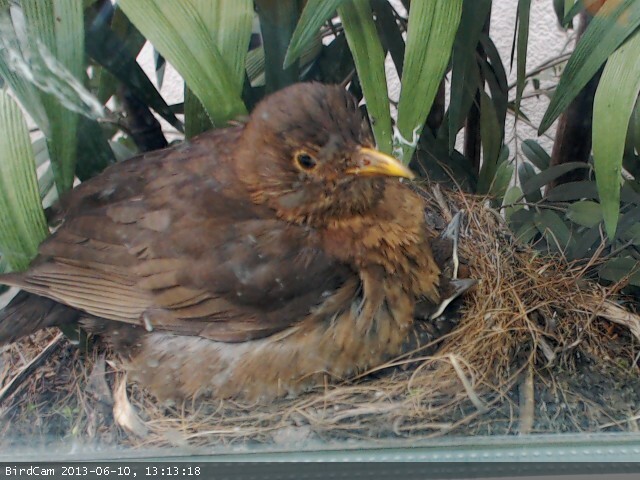 We dismantled the webcam today since all it was showing now was an empty nest. 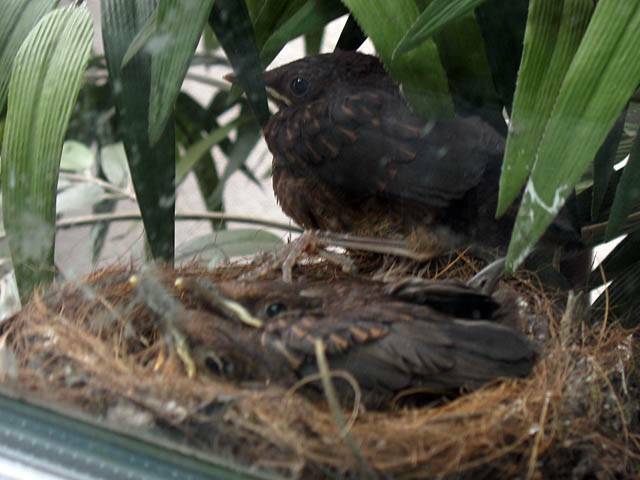 Two of the chicks sat in branches of the fake trees on the patio near the nest. 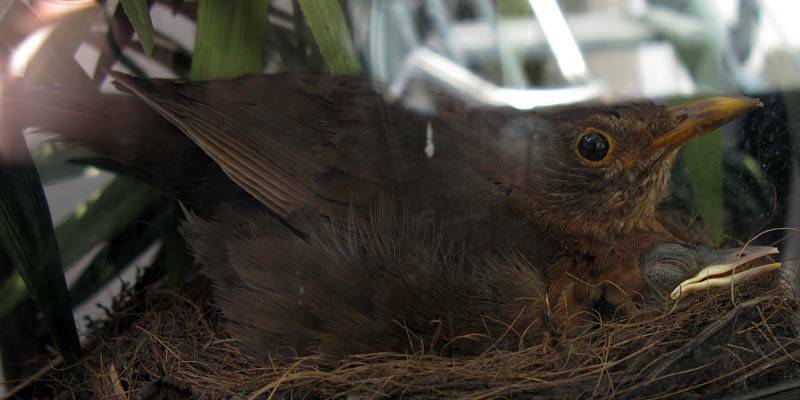 Mum checking over one of the chicks just after feeding it. 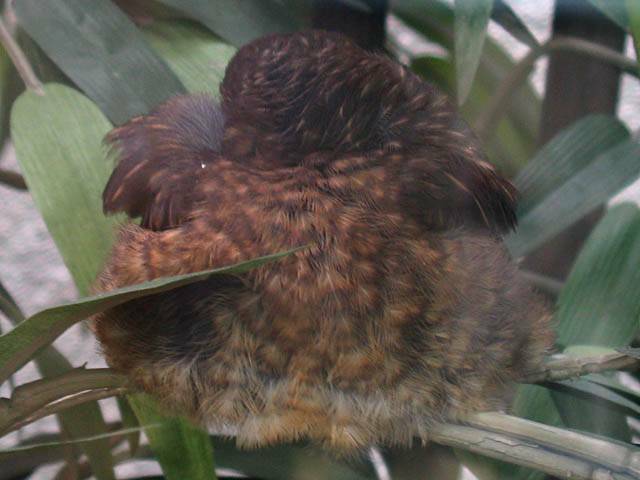 One chick snoozing while the other observes. 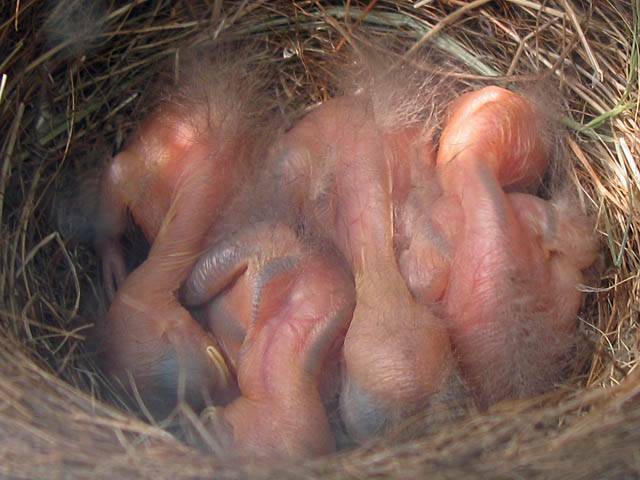 There were more chick moments on Friday 14th. At about 9AM I could hear a tweeting sound. 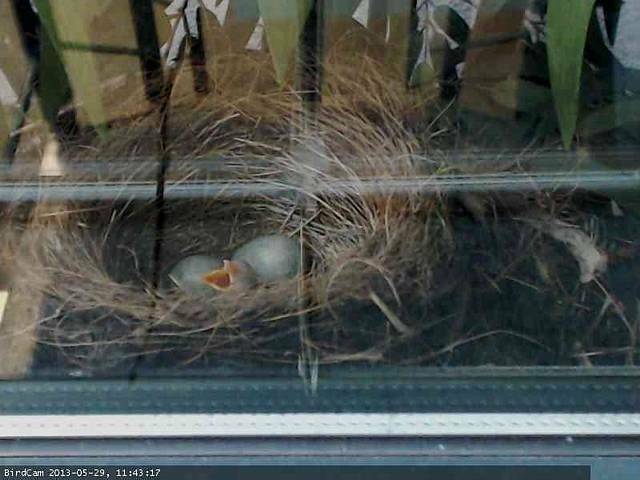 I looked up at 2 open slanted windows to see one of the chicks on the frame between them looking into the office. No not good as I didn't want it to come inside. 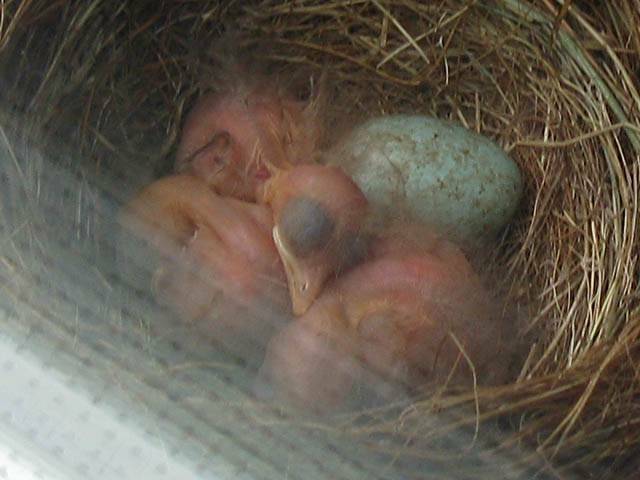 I grabbed a window pole and tapped it against the frame near to the chick. That encouraged it to fly away to safety across the wall. 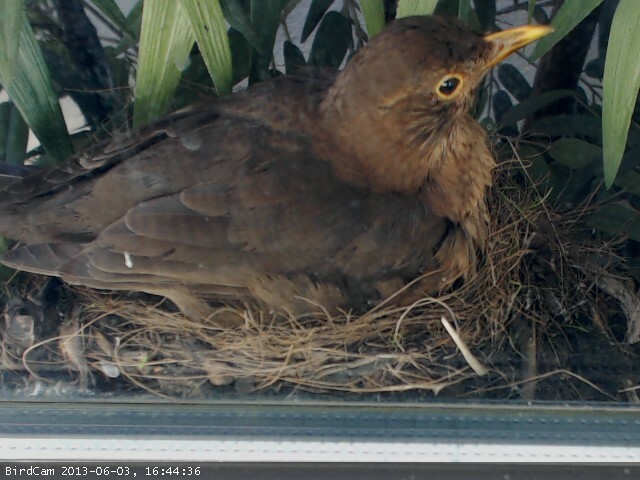 Then at about 10:30AM a chick (same one maybe?) tried to land on the window frame further along. 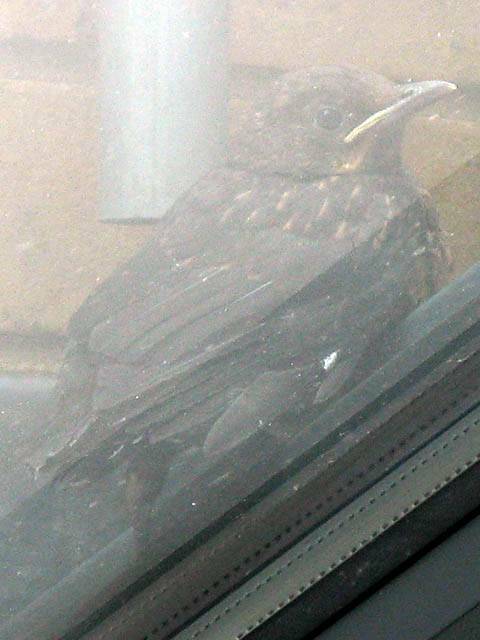 It couldn't get a grip, and after some furious flapping it slid down a large slanted window pane before coming to rest on the side looking bemused. 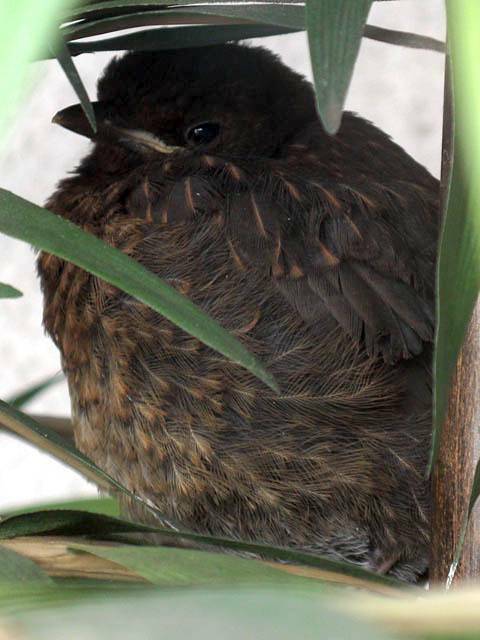 Meanwhile, one of the younger chicks stayed put in one of the fake trees all day. It had been there for 48 hours now not really moving. 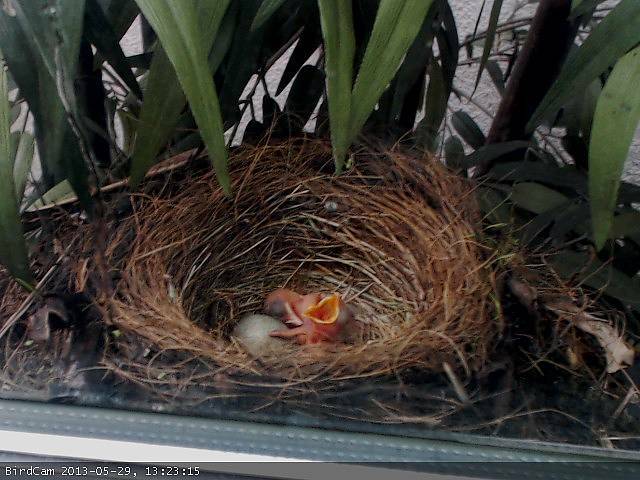 It was being fed by both parents and snoozed a fair bit. But why was it not exploring like its siblings? The chick that just slid down the sloped glass after losing its grip. This chick has been sat in the same spot for 48 hours. Is it OK? 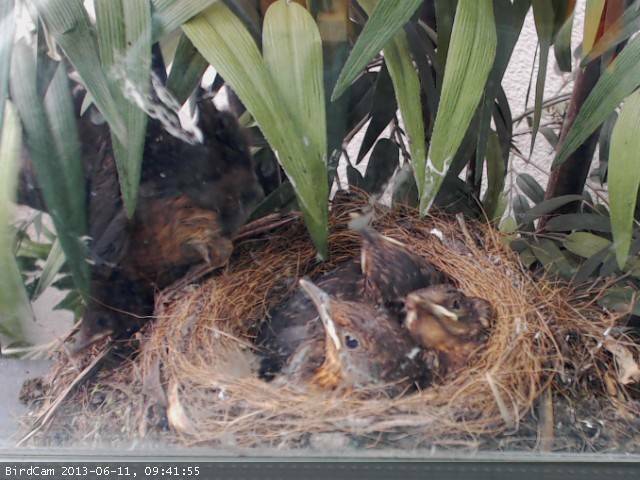 Thankfully by Monday 17th all of the chicks and the parents had vanished. 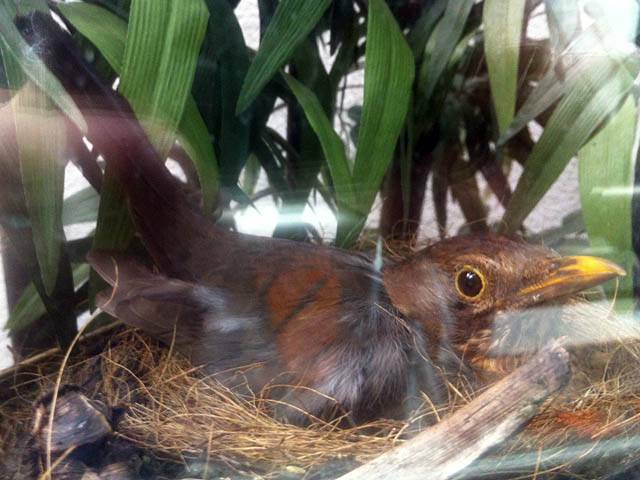 So I guess last week's chick in the tree was just biding its time getting ready for the outside world. 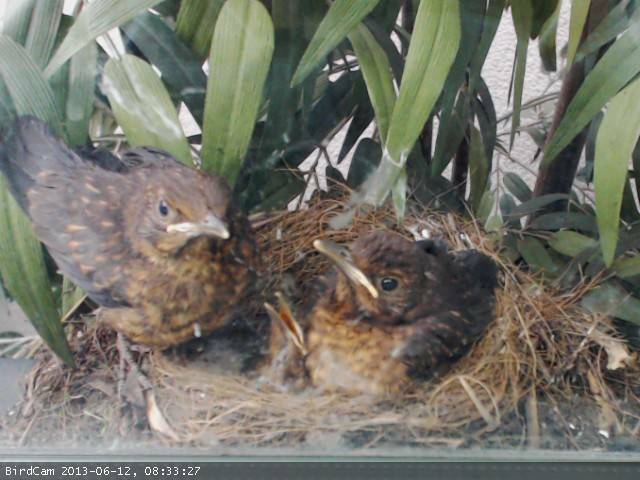 Apart from a brief appearance by a chick on Thursday 20th they haven't been seen since. So that is the end of the story. 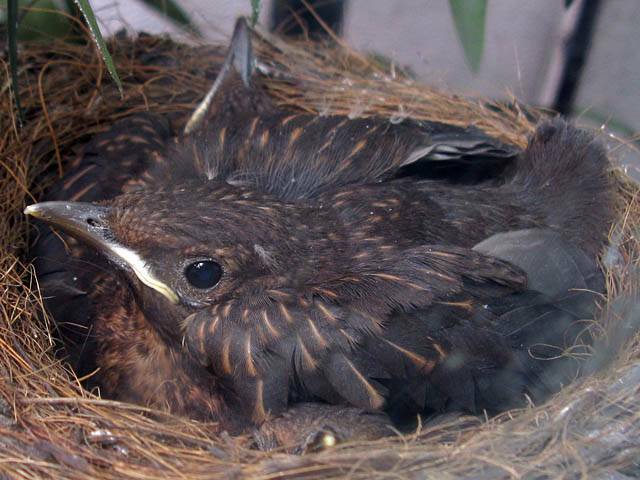 According to the RSPB website Blackbirds can sometimes use the same nest for successive broods, and can have up to 3 broods a year. 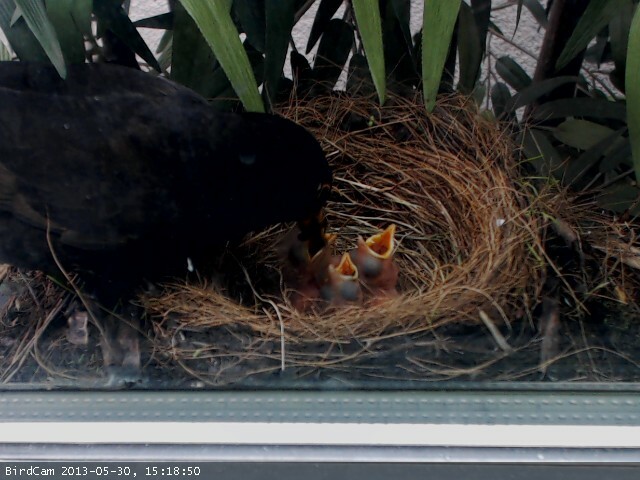 So will Mrs B return in July for another brood? 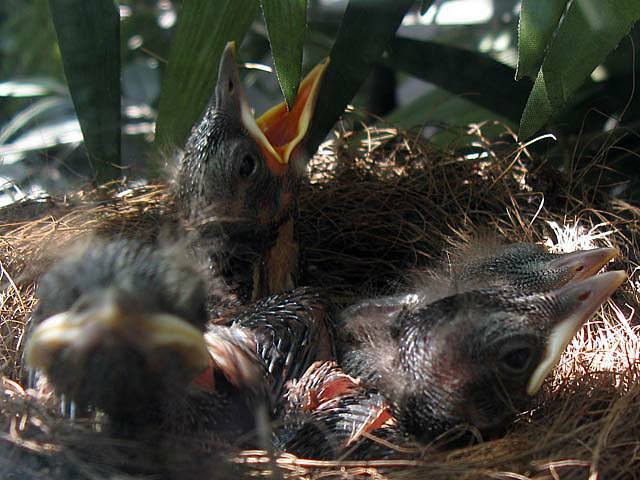 It is certainly a great location for a nest - sheltered and out of reach of predators. Time will tell.